Now that the islands are once again in the hurricane season it is good to look at past hurricanes. I have a copy of the petition from Saba residents presented to the West India Company for help after one of the greatest hurricanes had devastated the West Indies. Thanks to Ryan Espersen who is doing extensive research on a project of enslaved Africans he shares with me whatever he thinks can be useful to me for my writing. One of the documents I have and which I will deal with sometime are the claims for damage by the inhabitants of St. Martin after the hurricane of 1819 which left over two hundred people dead there. This document is interesting to those who can see that many of the surnames on Saba then no longer exist. Also the islands were in a state of slavery then and these names are those of white settlers only at that time. Also years ago I published this document in the Saba Herald and the names on the document in my book “Tales From my Grandmother’s Pipe”. 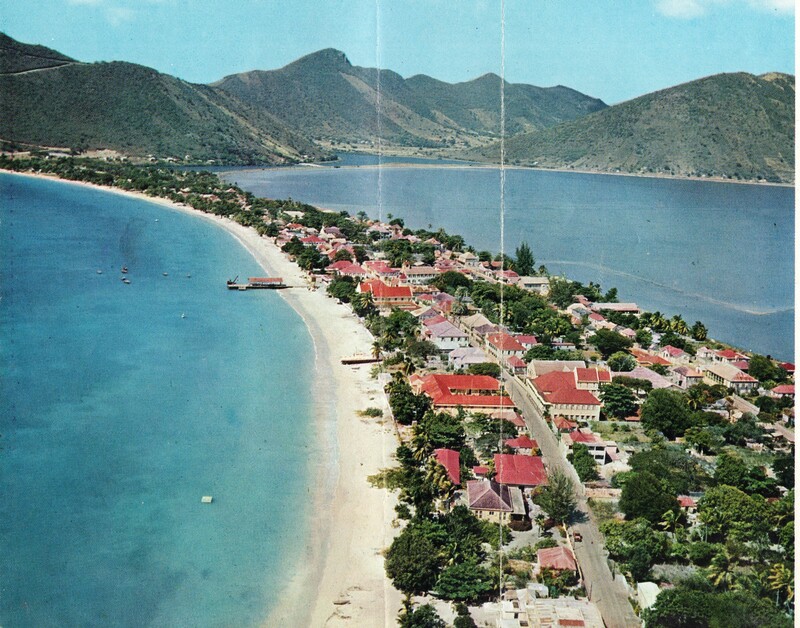 The petition does not include everyone of course and many people from Saba at that time also lived on the island of St. Eustatius from where they did business and many of them were intermarried with the merchant families of that island as well. So it is not to be looked at as a sort of census. It is merely a petition signed by some of the heads of households on Saba at the time. 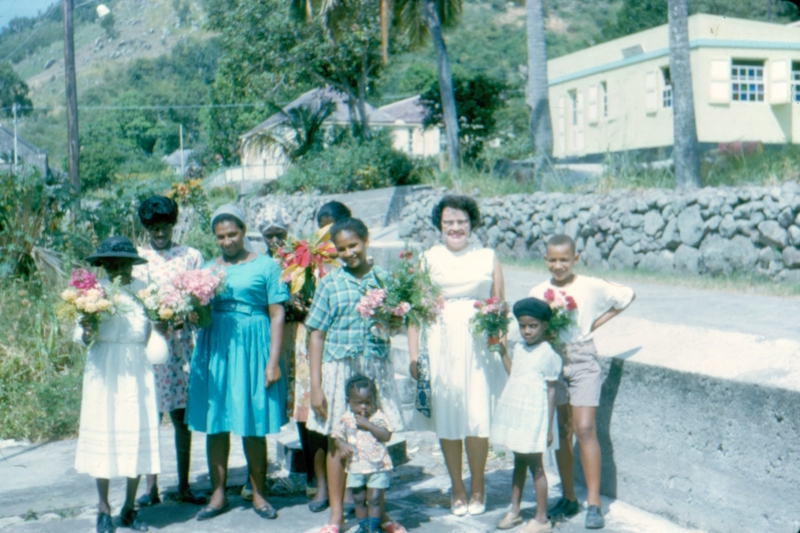 After the economic decline of St. Eustatius a number of these St. Eustatius/Saba families moved to Saba. 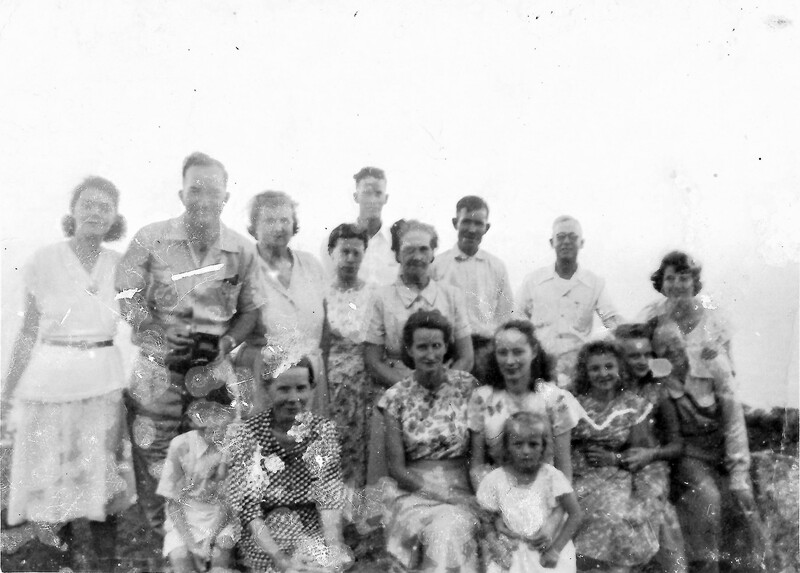 Families like the Holms, the Hortons and others only came to live on Saba around eighteen hundred or slightly before. On this petition I see a number of my ancestors, Peter Johnson, Peter Simmons, Daniel Every, Richard Hassell and interesting as spelled here Jacob Valane which later became Jacob Vlaun. He was a grandson of a Jacques Valaen mentioned in a document of 1688 on St. Eustatius in which he was one of the debtors to the West India Company. From my research he was a Courlander who came out with the Dutch to these islands. At one time the Courlanders were in possession of the island of Tobago. They originated in the Baltic, which was colonized for a long time by wealthy German and Dutch merchants under the Hanseatic League. His descendants first moved to St. Maarten while a handful moved to Saba. This particular one was the grandfather of my great grandmother Sarah Elizabeth Vlaun. He was one of those who had to take shelter in a cave on Hell’s Gate which is known as Vlaun’s Cave and is in the cliff below the house of Mr. Robert Hassell (also one of his descendants by the way). I use this story often to irritate certain people as an example as to how long my ancestors have been in the West Indies. A certain hotelier even wrote a letter to the newspapers that I wanted to take Saba back to the days of the cavemen. He did not understand the message I was sending and eventually went his own way leaving me here to contemplate if ever the need should arrive whether or not I should choose Vlaun’s cave as my new abode, like my ancestor did. Part of the 1772 petition. Very nice handwriting. I have not found out yet if there were any results achieved. Furthermore the Great Hurricane of 1780 was even more severe than this one so there would have been much more damage. The Governor in 1772 was Peter Simmons married to Rebecca Correa and their daughter Mary was married to the Rev, Hugh Knox mentor of Alexander Hamilton. Whoever drafted this petition had an excellent handwriting. We do not know how much effect it had but we must say that despite our cultural differences with the Dutch in recent years they have been extremely generous to us in getting our island up and running after the many hurricanes we have been experiencing. The Anglican Christ Church in The Bottom. Was destroyed in the hurricane of 1772 but rebuilt and still proudly standing in 2015. Some explanation is in place for the following. There were a number of people with the same surname and first name so we will suffice with one name and after that a number. As you can see the names are nearly all of English origin. With that we include Scotland and Ireland. Dutch historians and officials had the tendency when they could not spell an English name to turn the name into a Dutch name. Also at the time of this petition the island was under slavery laws so the names listed here are all heads of households (men in this case) and of European descent. The Governor at the time of the Great hurricane of 1772 was Governor Peter Simmons who served from 1743 to 1778 following in the footsteps of his father Charles Simmons. Other Christian Gentlemen, & Citizens of the City of Amsterdam. The Humble Petition of the Governour, the Council, Church and the Burghers of this island. That whereas your petitioners have been Sufferers above the Inhabitants of all their neighbouring Islands in the West Indies, most of us lost our little all. Our houses, our clothes, our furniture, our crops, and even our Coffee trees, by the late dreadful Hurricane of the 31st of August; and being reduced to the utmost distress, not only by the want of Money, but of all of the necessary’s of Life, and means of procuring them, having 140 of our dwelling houses, out of 180 which were upon the Island, dashed to Pieces, inasmuch that Numbers of our families, even at this distance of time, are obliged to Shelter themselves from the inclemency’s of the weather under Rocks and caves of the Earth, half naked and Famishing with hunger; unable to help themselves, and others by reason of the universal nature of the calamity being unable to render them any effectual relief. And which affects us most of all whereas, God hath been pleased, no doubt as a just punishment of our sins, to smite his own house among us and Lay it in ruins – A great labour and expense which the poor Inhabitants, could hardly bear; so that we are at present without any place of worship, & have no prospect of being able to build one for many years yet to come, unless assisted in a charitable way by our Christian Friends, whose charity may prompt them and whose Prosperous and affluent Circumstances may enable them to aid us, in what we hope they will Judge so Laudable an undertaking.— And whereas we cannot with any propriety apply for such aid to any of these islands, who are all our fellow sufferers, and many of which need charity themselves, tho’ none in the measure that we do; We have thought proper, urged by the most pressing necessities, to apply in this manner to you our European friends, who by your situation are happily Exempted from these desolating Judgements. Humbly beseeching you to take our distressed, Ruined circumstances into mature Consideration, and to do with all convenient speed what Humanity and Christianity will dictate to you for our Relief, on so melancholy an Occasion; not only in helping us to build a House for Gods Publick Worship, but for the Relief of Numbers of families among us, which are reduced to beggary, & the most heart affecting wretchedness. 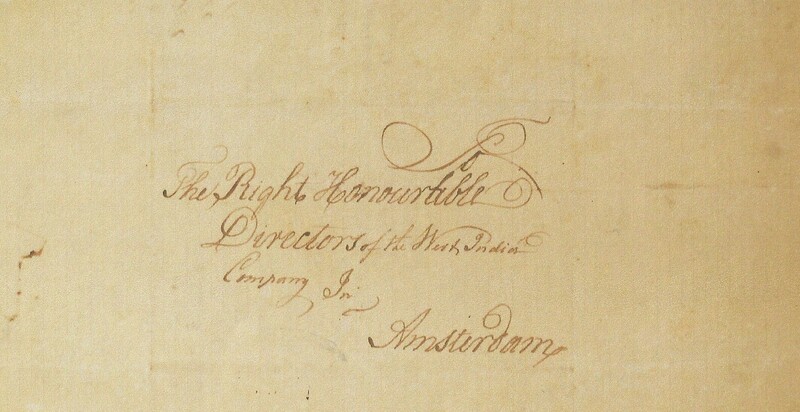 We do hereby beseech and empower our Trusty and well beloved friend, Mr. Nicholas Doekscheer Merchant in Amsterdam to receive such charities as the Christian People of Amsterdam will be pleased to give, and, our Benefactors may be assured that their Charities shall be appropriated according to their benevolent design by the Governour and Council of this Island. B: William Baker, John Beaks, Charles Bonyea, Simeon Bonyea. C: Joshua Carter, Peter Carter 2x, Jacob Cox, William Cox. E. Anthony Every 2x, Daniel Every 2x, James Every 3x, John Every, Peter Every. H. John Haddock, Abraham Halley 3x, James Halley, Peter Halley, George Hassell 3x, Hercules Hassell, Henry Hassell 5x,, John Hassell 3x James Hassell 8x, Peter Hassell 6x, Richard Hassell 2x, Thomas Hassell 5x. .L.Charles Simmons Leverock, James Leverock 5x, Moses Leverock 3x, Richard Leverock, William Leverock 4x. W. Richard Winfield, Richard Wood. Hurricanes can come at anytime. 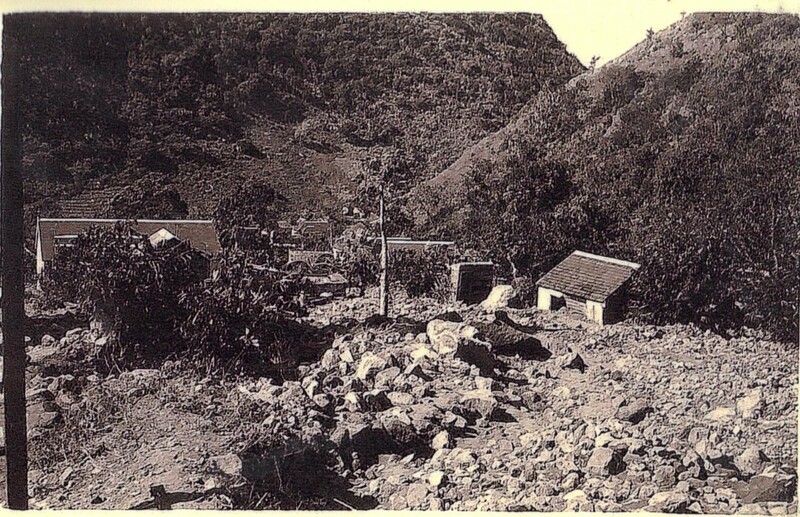 Destruction caused by the Alice hurricane of January 2nd, 1955 where in a 24 hour period there was 22 inches of rain and many landslides all over the island. On St. Croix young Alexander Hamilton wrote the following letter to the local paper edited by the Reverend Hugh Knox who after having served 20 years on Saba had migrated to St. Croix with his wife Mary daughter of Saba’s Governor Peter Simmons and his wife Rebecca. The letter is dated September 6th, 1772. I take up my pen just to give you an imperfect account of the most dreadful hurricane that memory or any records whatever can trace, which happened here on the 3st ultimo at night. I had a great uncle George Simmons “Unc” born in 1850. He was 12 when his great grandmother died and 22 when his grandmother died. His mother was Alice Eliza Horton and Unc claimed that the Horton’s were related to Alexander Hamilton. 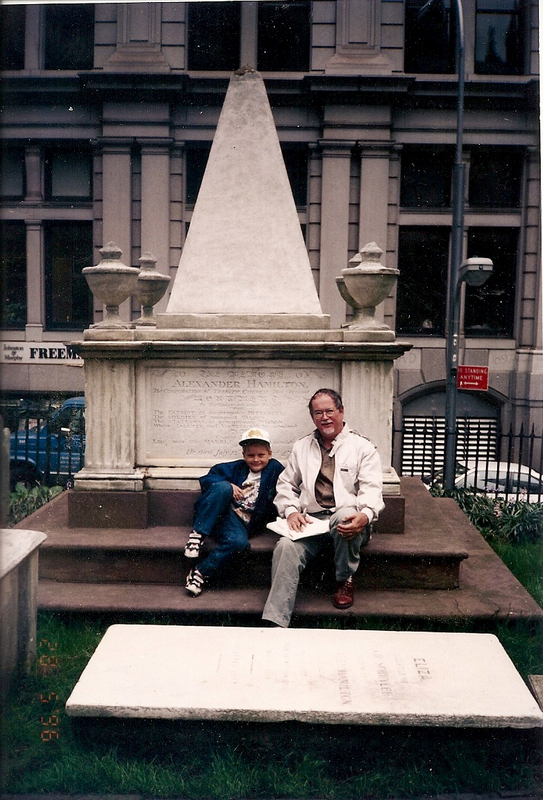 Here in New York with my son Peter checking on his family plot and I think one of his daughters was also Alice Eliza. It began about dusk, at North, and raged very violently till ten o’clock. Then ensued a sudden and unexpected interval which lasted about an hour. Meanwhile the rain was shifting round to the South West Point, from whence it returned with redoubled fury and continued so till near three o’clock in the morning. Good God! What horror and destruction impossible for me to describe – or you to form any idea of it. It seemed as if a total dissolution of nature was taking place. The roaring of the sea and wind –fiery meteors flying about in the air – the prodigious glare of almost perpetual lightning – the crash of falling houses – and the ear piercing shrieks of the distresses, were sufficient to strike astonishment into Angels.” The letter is too long to be quoted in full for this article, however Hamilton then only fourteen guided by the Reverend Hugh Knox and financed by the businessman Cruger was sent to the United States and went on to become one of the most important founders of the Federal Government of the United States. There were even some reports that bark was stripped from trees in some locations. Generally this only occurs if winds are in excess of 200 miles per hour. The French fared no better, losing an estimated 40 ships and four thousand soldiers. 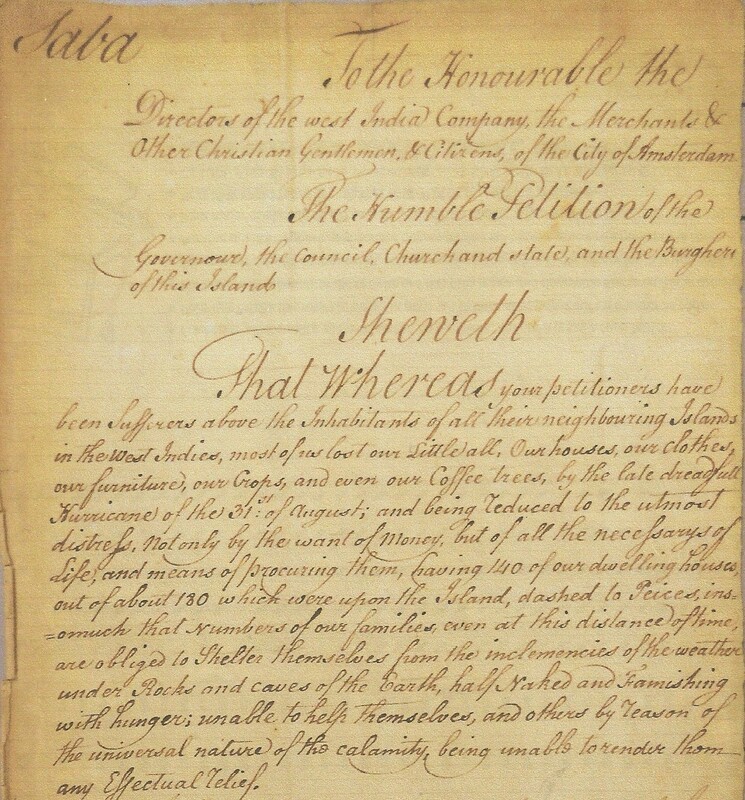 In old documents it is stated that St. Eustatius lost five thousand people in the 1780 hurricane. However historians have reduced that number to five hundred which in itself is a large number of people to be lost in a hurricane. Saba suffered as well but not as bad as Statia. 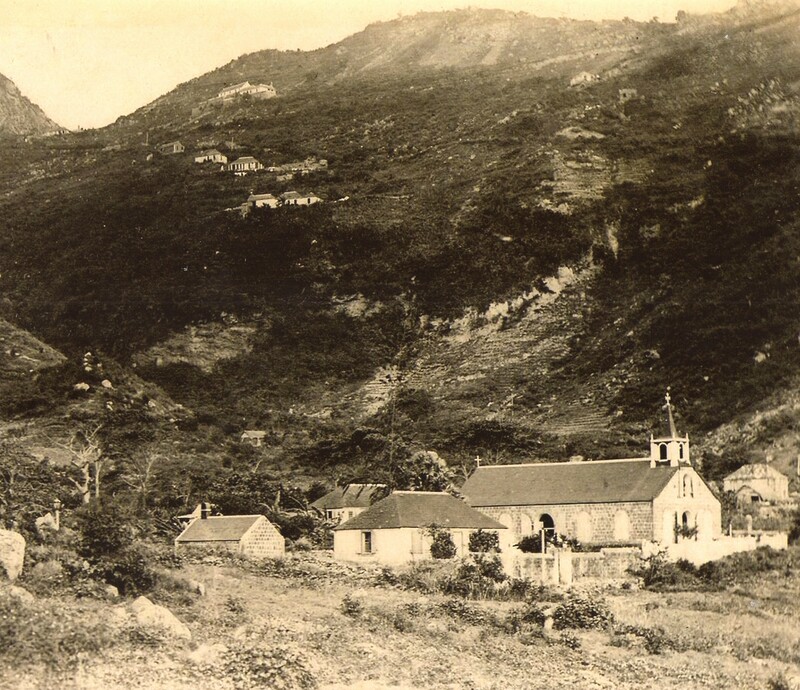 The church lost in the 1772 hurricane had been rebuilt in stone and is still standing as the Anglican Christ Church in The Bottom. And so we can read that here have been some wicked hurricanes in these islands and as history repeats itself more will surely come. 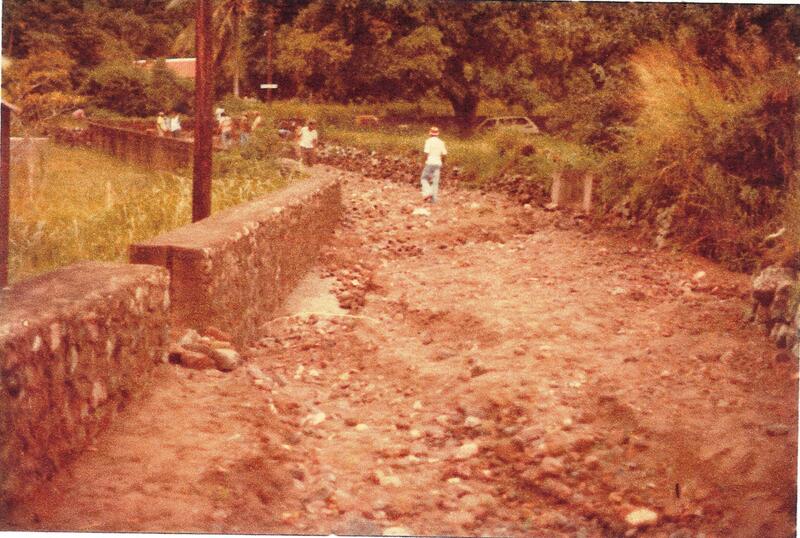 This is a photo taken a few days after hurricane Luis in September 1995 showing my neighbourhood on Saba. The old timers claimed that the church doors of the Dutch Reformed Church on St. Eustatius ended up close to my house on Saba in the hurricane of 1772. Schooner “The Three Sisters” in Curacao harbour. Owned by Capt. Abram Hassell and his brothers. Used to carry people from all over the Caribbean to Curacao in search of work by the SHELL oil refinery. Lost off St. Croix 1932. The “Blue Peter” which transported passengers and mail between the SSS islands and St. Kitts from 1947 to 1962. I sailed many time on this fine schooner, but her motor was too small and she was slow. 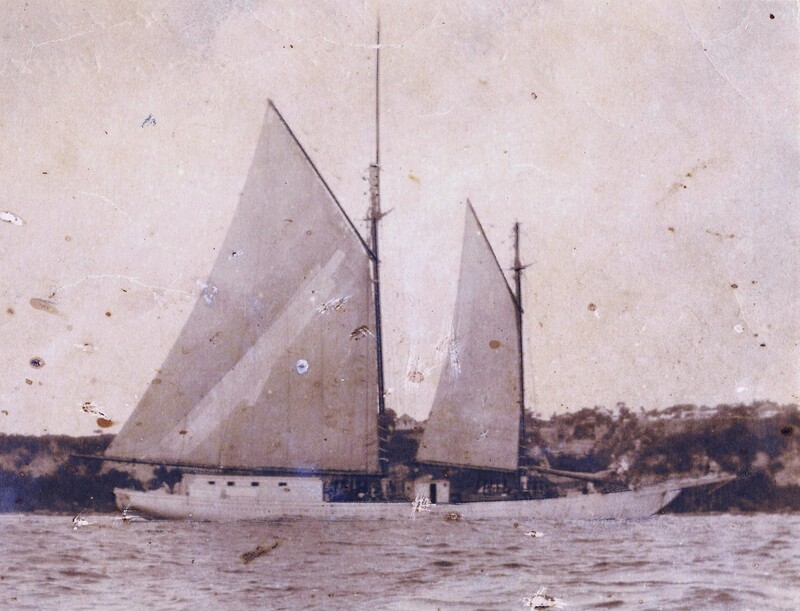 I post a lot of old photos of some of the many schooners owned by natives of our island Saba in former times. In my books I have also given quite a bit of the history of our people’s involvement with the sea. A friend of mine on St. Martin contacted me here of late and asked that I visit with him when I have time so that I can give him more details about the people who owned these large schooners and so on as he is fascinated by the fact that hardly anyone today knows of Saba’s days of glory in the West Indies schooner trade. Some years ago I wrote the following article which one of the tourism magazines on St. Martin published. My brother Eric staying in one of the hotels found the article and wrote his own opinion about it as he said this was another way of promoting tourism to Saba which few people knew about. This article was written after coming over by boat to Saba instead of by plane. Since then I have made many journeys across the Atlantic, the Mediterranean, the Baltic and so on. Yet again I am on course for another long sea journey following in the path of my Viking ancestors and so all the more appreciation for a voyage by sea rather than by more modern means of transportation. “Coming to Saba by way of the sea, relaxed and at ease, gives time for reflection and meditation. Unlike our ancestors whose journeys were made in hardship we can now travel in relative comfort. We used to be able to travel in “STYLE” and in recent years on “THE EDGE”. Schooner “The Mayflower” owned by Capt. Thomas C. Vanterpool. My uncle Capt. Charles Reuben Simmons told me that he carried as many as 250 passengers. Left from Nevis and was in Curacao 48 hours later. Pictured here in St. Eustatius harbor. When travelling on the sea you realize why there are so few seamen philosophers in the past. Perhaps in having to brave the elements and in the pounding of the ocean, all concentration is in that part of the brain tuned in to survival, and when landfall has been achieved you are so relived that it erases all that which has been reflected on during an ocean voyage. In the vast expanse of the ocean the stars and the moon seem within closer reach than the nearest landfall. Unlike desert travel everything around you is vibrant and alive, waiting to swallow you up as it were. Capt. (Commissioner) Matthew Levenston pictured here with his sloop the “Gloria”. He and I nearly got lost together on this sloop during a storm in September 1957 on our way to St. Martin. It seems to even swallow up your thoughts, and thus the sea has produced many good writers but few philosophers, whereas the desert, dead and still, with the moon and the stars closer than the nearest oasis has produced a great number of philosophers and prophets in the Arabian and ancient world. The Bible and the Koran are both products of desert travel and survival. 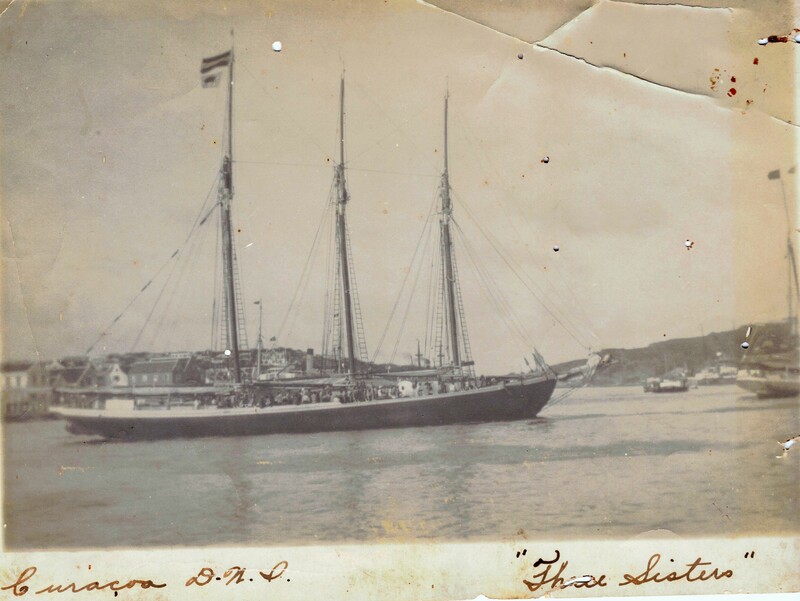 Schooner “Ina Vanterpool” lost in the hurricane of September 1916 in St. Eustatius harbour. 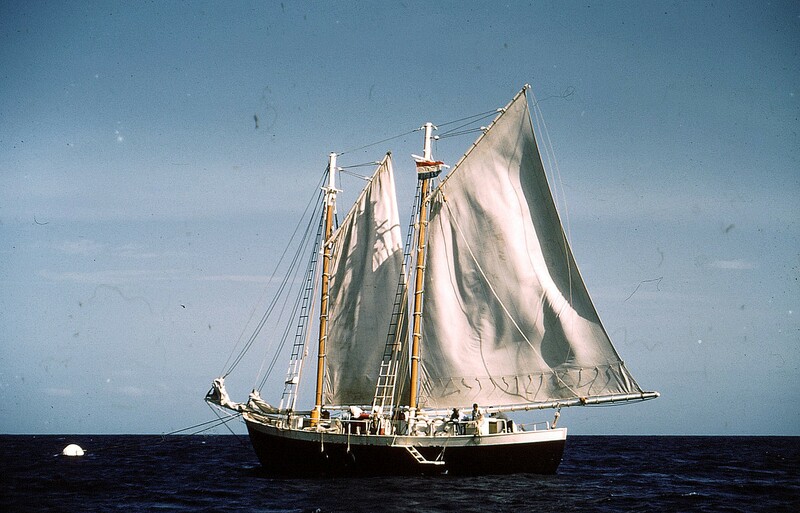 Was one of the many fine Saban owned schooners carrying passengers and freight to Curacao. In my own experience in a small boat on the mighty ocean, the ocean keeps all your senses active and alive. Even when sleeping you are somehow aware of riding on the back of a live companion. We Sabans have always been a people of the sea and we renew our historic association with her each time we venture out upon her vast expanse. Schooner “Priscialla” owned by Capt. T.C. Vanterpool yet another fine schooner which carried passengers and freight between the Dutch SSS islands and Curacao. The times have certainly changed sea travel between our islands. I can still remember post hurricane trips on old sailboats which often became becalmed and at times it took days to get from here to there. Many people have their own stories to tell of horrifying experiences with sea travel. There were other times when you were frapped about and battered through squalls so bad that upon reaching your destination you were deeply appreciative of having survived. The wish for survival is greater than the ability of reflection and meditation. There have been important changes in sea travel in recent years. I can remember in a letter to me by Sir Richard Goddard of Barbados whose mother Ida was the daughter of Capt. Ben Hassell of Saba who owned many schooners back in the day. Sir Richard told me that when his cousin Joey Hassell once came to Saba from St. Kitts he had traveled “first class” in a row boat. When asked how that was possible Joey explained that the second class passengers sat on the side of the rowboat from where the waves were splashing into the boat thus giving somewhat of a protection to the “first class” passengers sitting on the other side. And so that would cost you more and was considered “first class” travel. The “Mona Marie” one of Capt. 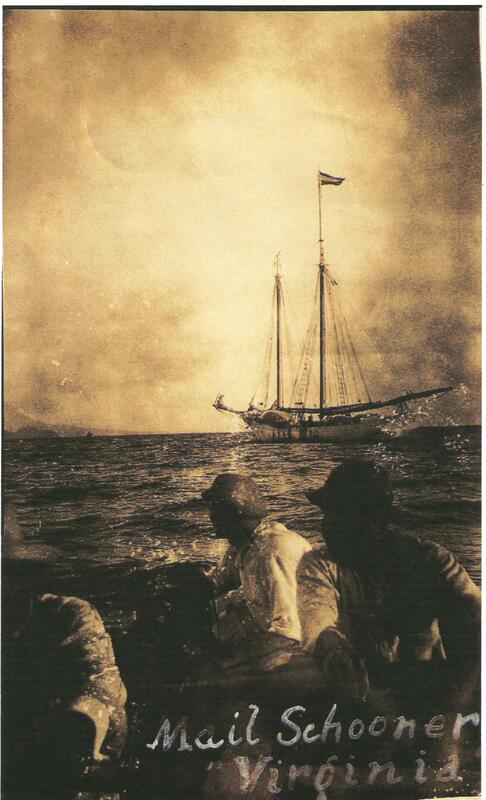 Ben Hassells fine schooners which traded in the West Indies and called at Saba. The poem is by Stella Richardson-Sloterdijk of Saba. Also closer to home my aunt Mrs. Grace Louise Hassell born Simmons once on a small sailing boat heading to St. Martin for a medical emergency after being becalmed three says at sea had to be rescued by a small motor boat from St. Martin and brought to shore. No communications back then so you had to assume when the boat stayed so long on the horizon that something was wrong. The schooner the “Virginia” owned by Capt. Abram Mardenborough of Saba and living at St. Martin. Built on Curacao by S.E.L. Maduro & Sons shipyard. Later bought by government for passenger service between the Dutch SSS islands and St. Kitts and St. Thomas. The same happened with my sister Sadie on the “Blue Peter”. After several days she too had to be rescued by a small motor boat from Simpson bay. I remember her departure from our home as somehow I was on the island back then. My father Daniel Johnson, was from the old stock. A mason, farmer fisherman, survivor. No public display of emotions from this kind of man. This was the first time I saw him cry. He never displayed any emotions before in my presence, but when they carried my sister out to the waiting motor vehicle on a stretcher and he said goodbye to her he turned away and broke down and cried. And with good reason. In a few short years she was no longer in the land of the living. 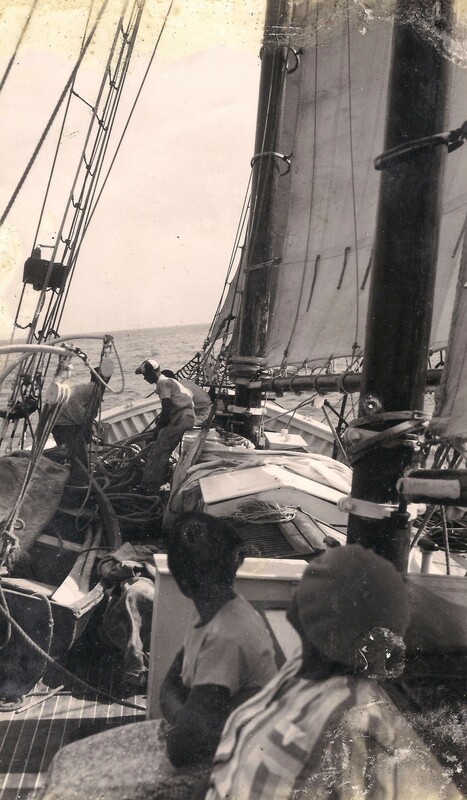 I have already written the story of the students from Saba and St. Eustatius together with Administrator Walter Buncamper who in the hurricane of 1950 nearly got lost in a sloop which belonged to Mr. Emile Tackling of Grand Case. My brother Freddie was on board. I also, together with Capt. 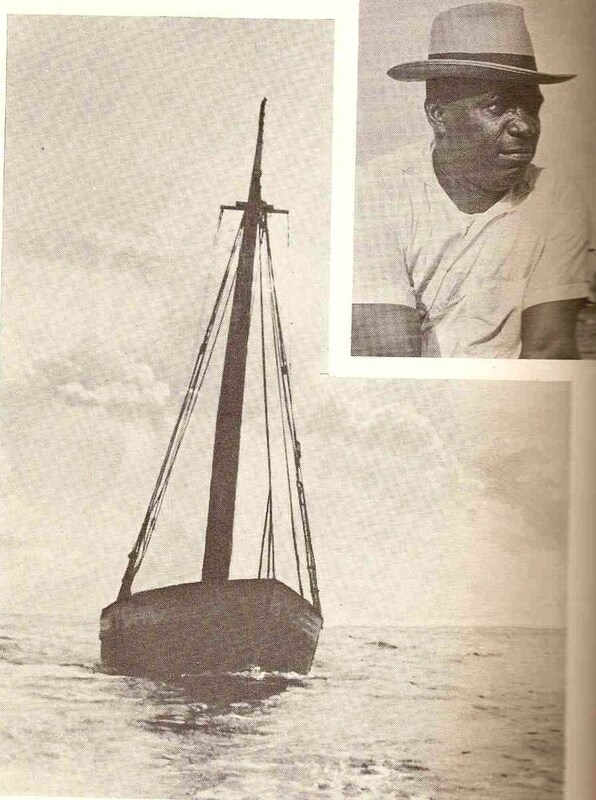 Matthew Levenston and Mr. Percy Labega nearly got lost on his sloop the “Gloria” in September of 1957. And there are so many other stories of horror trips between these Leeward Islands when there was only travel by sea as a possibility of travelling between the islands. Now you can travel from St. Martin to Saba in just over an hour on the motor vessel “THE EDGE”. It can carry up to fifty passengers. It succeeded the ‘STYLE” which used to carry out this service for a few years. Durable sea transportation to Saba is now being provided through the innovative and practical design of “THE EDGE”. When I first wrote this years ago I said; “The boat is comfortable, has a good looking female captain and the ship can handle these waters most of the year. Others have attempted this run in the past with larger boats and have failed where “The Edge” has succeeded. Capt. 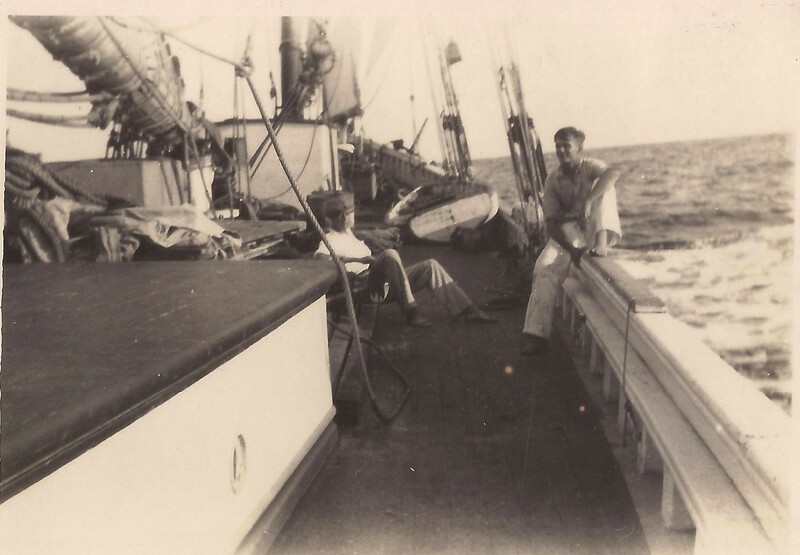 Laurie Hassell sitting on the railing, then 19 years old and Captain of the lovely schooner the “Mona Marie” owned by his father Capt. Ben Hassell who lived on Barbados. In recent years Craig Buchannan with his boat the “Dawn II” has started a service from Saba to St. Martin and back with passengers and freight and many people use this boat as well. When, because of weather conditions, the planes cannot land on Saba’s airport and Medical Students are travelling, Craig’s service is of vital importance to the island. Although not as fast as “The Edge” it is comfortable. I love the sea, and when the weather is good, I really appreciate the crossing to Saba by boat. It brings back to mind my roots anchored deep in sea life, and of island life in former times. From our pirate ancestors, Hiram Beaks, Henry Every (alias John Avery), Daniel Johnson (“Johnson The Terror”) and all the others, the genes have taken along more than their fair share of the salt of the ocean which calls us back from time to time. Passengers on the government owned schooner the “Blue Peter” headed to St. Martin. We are an island people, a sea faring people. Even though we are mostly land based now and take the plane most of the time, each time we go down to the sea, it brings back to us echoes of a distant past when as seafarers we rode upon the oceans back in frail craft to distant lands and back home again. May her generosity to island people continue as in the past. As “THE EDGE” rounds the bend of the “DIAMOND ROCK” and we prepare for landfall I am reminded of a poem by Henry Vaughn (1622-1695). This article has been adapted from an article which was written as a tribute to “WEEK OF THE SEA” at the elementary school on Saba on February 18th, 1998. Dr. Julia G. Crane being honoured on her birthday by friends on Saba who were her constant companions when she did her research here in 1964 and in later years. A tribute to the work of Dr. Julia Crane. The following article was written by my deceased cousin Carl Lester Johnson a former banker in New York. I have written about Dr. Julia Gorham Crane’s work before. This article deals with it from the perspective of what effect it had on Lester and how much her work should be really appreciated by people of Saban descent. One aspect which he was unaware of was her extensive interviews with people of Saban descent and the many photographs which she took of Saba and its people while she lived here. Those interviews led to her second book “Saba Silhouettes” which preserves much of Saba’s history from the people who were interviewed for the book. Lester’s article was written on October 24th, 1974 and was titled “THE COUPLING LINK”. “Who am I? Where did I come from? When did I begin? How can I know? What were my forebears? If one were faced with all these questions at once, it would mean that one knew no heritage; consequently, lacking a complete self. A coupling to our heritage, is very important to the wholeness of one’s self; self, in turn is what we perceive ourselves to be as individuals. Not to know ourselves and the hereditary factors which shape our lives, would truly be a tragedy. 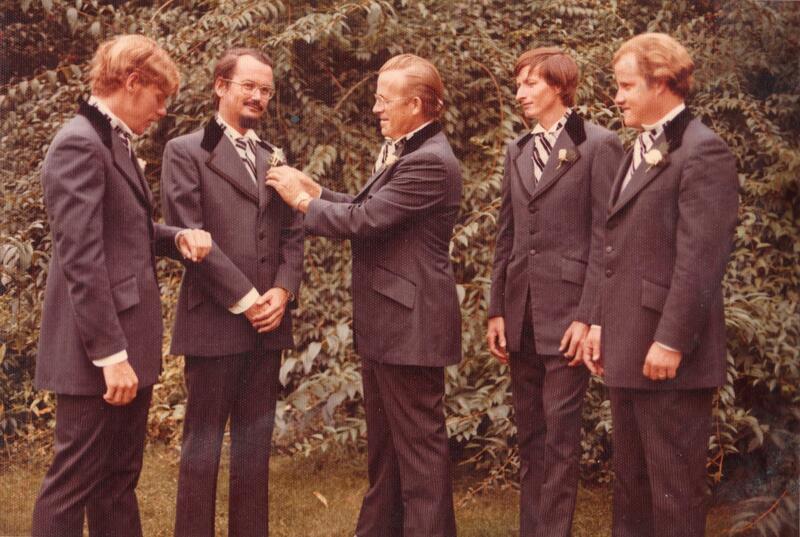 Carl Lester Johnson best man at the wedding of his cousin Will in Brookville Long Island in 1973 doing last minute adjustments before the start of the program. Just like ,my cousin Lester, I too at the age of twelve would at times go to the Fort Bay to bring up cargo on donkeys for the merchant Mr. Carl Hassell in Windwardside. “Self-perception and the insights that shape our lives, come to us at the most unusual times. I clearly recall my first act of self-perception. At the time I was a young man and living on Saba. It was during World War II and no ships had called to the island for quite a while. On that particular day, a ship had come in and brought the naked necessities of life. I had made five trips from the Fort Bay to The Bottom, driving five donkeys; my sixth trip had been straight through to the Windwardside. When I was finished I sat down on the path leading to our home. Suddenly, an awareness came over me. I looked down at my hands and I became aware of myself as an individual. My extremely close relationships with friends and family stood aside and for the first time I became fully aware of Carl Lester Johnson as a person, separate and distinct from all other persons. It was at this particular moment that I determined the direction that has led to where I am today. This decision was no grand design, it was the sum product of my heritage. You see, I had been educated to emigrate. This was an existential decision. It was a good decision; a decision which was the outgrowth of my cultural heritage. The heritage so important in determining how we grow and how long we live. Dr. Julia Gorham Crane here letting children from The Bottom hear their voices for the first time on tape. “This awareness of the importance of my heritage, over the years, made me very conscious of the heritage of others. Because of this, I have been greatly assisted in my relationships with others. Therefore, when we have been so greatly assisted in knowing our collective selves, we must feel gratitude for that assistance. I would like what follows to be an expression of a warm feeling of kinship and gratitude for a very lovely person, whom I know, but I have never met. The first time I read ‘EDUCATED TO EMIGRATE” by Julia G. Crane, I did so without a predisposition to the acceptance of what I was about to read. I had never read anything about Saba, by a non-Saban which had ever been very objective. Although, much that was written was always done with kindness and understanding; as an Island Culture, we were always treated as curiosities. When faced with the results of a thorough intellectual process, the product of a great effort and a work of love; although I had pre consciously hoped for it, I just could not consciously accept its existence. I was again drawn to the book. As I read it and contemplated its bibliography, I could not help to ask myself, “What had brought a young woman from the heart of the continent to perform such a labor of love for a microcosm, our little world, our Saba. Lester before he got married left his banking job in New York to follow a life at sea in the footpaths of his father and his other ancestors. He had a serious accident and after that he returned to banking. As someone on Saba gave as reasons for working in the Post office “You ever hear of anyone drowning in the Post office?” Nor in a bank I might add. Many times throughout many years in an alien environment, in order to make adjustments, I have had to review the harshness of my beginnings to reassure myself that I possessed the inner strength to deal with the complexities of the constant mechanization and dehumanization of my adopted land. These are bad times for all of us and when we face reality, we must admit that the road ahead is not an easy one. Therefore, when our eyes pass over the words and we realize that ours was a heritage of hard times, we became aware that within us there is that ‘Hard part of the Rock’ which is the equal of present hard times. Then we know that we will overcome. So, to be reminded of this solidness in our nature, is to fortify our strength and it is for this that we are grateful. “I am sure, a people who can stand at the monumental of their forebears which go back ten and more generations, have no doubts about their heritage. Most of it had come down by “word of mouth”; the rest was spread over many islands and several continents. To have it coupled together by the links of intellectual endeavor is the keystone that will bridge the banks of the past to the shores of the future. For this reason, we, as Sabans, cannot afford to ignore ‘EDUCATED TO EMIGRATE”. It is the ‘Coupling Link’ in the chain to the anchor of our heritage. Educated to Emigrate, is the first meaningful, scholastic effort devoted to us as a people. It inscribes us in the journals of history. So that we not forget or appear ungrateful, I ask my fellow Sabans to join with me in a move to name a school or library on Saba for ‘JULIA G.CRANE” who forged the coupling link. She is our intellectual benefactor. The memories of her, should not dim with the yellowing pages of her wonderful work. My cousin did travel quite a few paths in his youth. He also lived on St. Maarten while going to school there. He was born on November 30th, 1925 on Saba and in the nineteen thirties he lived on St. Maarten on the Cyrus Wathey square in a house owned by the Nadal family which my aunt Alice Johnson-Simmons used to rent. It was later the home of Norman Chester Wathey. Lester told me many stories of the people he knew there as a teenager from the leading families at the time. The Van Romondts and so on. He had loving memories of those days spent there. Before he left for the United States he also worked in the Post Office on Saba for a while. He once told me that at a certain point all foreign monies had to be turned in to government and exchanged for gulders. He said that you would be surprised as to the amount of gold doubloons which were turned in by some of the poorest families on the island descendants of the former pirates. Once in New York he gave me an old bank book to check on for him. It was from when he worked in the Post Office and had about ten guilders left on it. I made a case to the Post Office on Curacao and with interest over the years the bankbook had accumulated to over five hundred guilders. When I started the Saba Herald in 1968 Lester would contribute articles from time to time and they were very interesting. Like many Saba men who immigrated to the United States they married women from Saba or who had Saba ancestors. His wife was Louise Johnson of Richmond Hill. Her mother was a Holm a sister of Cecile and her father was a brother of “Miss Nora” Every born Johnson. He visited Saba with her on at least one occasion. When Lester lived on St. Maartin he lived in the house on the right which then belonged to the Nadal family. This would have been the scene he would have grown accustomed to in the nineteen thirties. He went into banking. I think it was the First National City Bank and he was a Manager of one of the branches out on Long Island. I remember visiting him once at this office and was quite impressed. Before he married he went through a midlife crisis and decided to follow in his father’s footsteps and follow the familiar path to the sea like all his Saban male ancestors. This only lasted a few years and he had a serious accident on one of the ships. After his recovery he decided to go back into banking and to settle down with a wife and family. He was a man who could do anything. I remembering visiting his home in Richmond Hill and he showing me all the carpenter work he was doing in his home, and like the Sabans back home he was getting help with the electricity installation from his cousin Percy Johnson and Merrill Hassell the Saban painting contractor probably helped along with the painting of his house. There were hundreds of Sabans living there at the time. When I would visit there they somehow thought that I was missing home cooking and when I got invited to someone’s home there was always a “Saba Pot”. My cousin Bessy Richter (sister of Lester) who is 92 and sharp as a tack told me many stories about life in Richmond Hill. Both parents lived to be 99 years of age. She told me when she moved to that place, everywhere she called and told them that she was looking for work and was a Johnson from the West Indies, no jobs to be had anywhere. Then someone told her;” Mind these people don’t know there are white people in the West Indies so you better go in person. The first place she went to they hired her on the spot. They later admitted that with her name and accent they thought she was black and they were not hiring blacks. So you see how it was back then. One story I cannot forget is that once she wanted to make a Saba Pot so she went to Jamaica (Long Island) to a butcher there. She told the lady at the counter that she wanted to buy a pig head. The lady at the counter told the butcher that there was a white woman who wanted to buy a pig head. The butcher was from Barbados and he came out to find out if the lady at the counter had heard correctly. He told my cousin that he had been a butcher at that location for more than forty years and he never expected that a white woman would come to buy a pig head. Being from Barbados he had heard about Saba and the older heads on Saba have a Barbados accent so he had a good laugh and did not need to be convinced why she needed a pig head. For added measure he probably threw in some pig tails, and feet as well. Visiting with his first cousins on Saba from left to right: Freddie, Eric, Guy, Will and Lester Johnson late nineteen seventies. “No man will ever lay his finger on the robes of his maker, if he does not accept responsibility for himself. Personal responsibility, is our greatest duty to ourselves and we exercise this responsibility, by making sure that we get what is coming to us; which is, a good education, followed by the right to not allow others to carry our burdens. Dr. Julia Crane being honoured on her birthday. While doing research she made many friends on Saba. Governor-General Jaime Saleh and Lt. Governor a.i. Will Johnson on Saba Day 1998 just after hurricane George. Mr. Saleh was here assessing the reconstruction of the island. There have been so many hurricanes in recent times that you tend to forget the names of some of them. Not hurricane Luis. September 5th 1995. For St. Martin especially this was a very severe hurricane. Not the least of the misery for St. Martin was the fact that it was followed a few days later by hurricane Marilyn to the South. Luis ravaged St. Martin and besides the financial damage caused it also had political consequences for the island’s future political status. St. Martin had been accustomed to a large measure of autonomy. 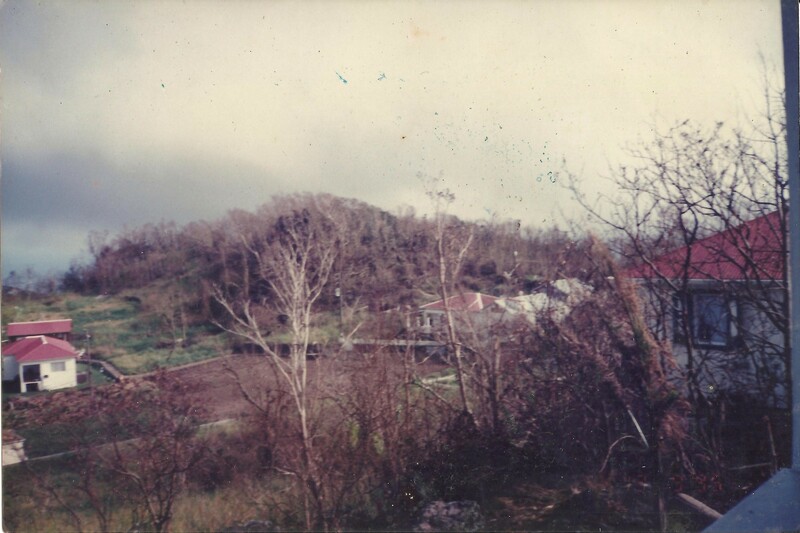 After the hurricane Holland came to the islands assistance in a massive way. Holland also made it possible for the island authorities to deal directly with them to get projects speedily approved. Under the circumstance there was no other way out. All the islands had experienced how slow things moved when they had to deal with the Central bureaucracy on Curacao. There was no time for the island authorities to deal with this bureaucracy. They had to get the island back up and running in a hurry or else their tourism product, the main industry, would be crippled. Even when there are no direct hits by hurricanes flooding can cause quite a bit of damage. This one took place in the nineteen seveties and flooded a large section of the roads in The Bottom. After the worst was over then Prime Minister Miguel Pourier was advised that St. Martin should deal with the bureaucracy on Curacao. Bad advice to say the least and the foundation was laid for further dissent between the island authorities on St. Martin and the Federal authorities on Curacao. 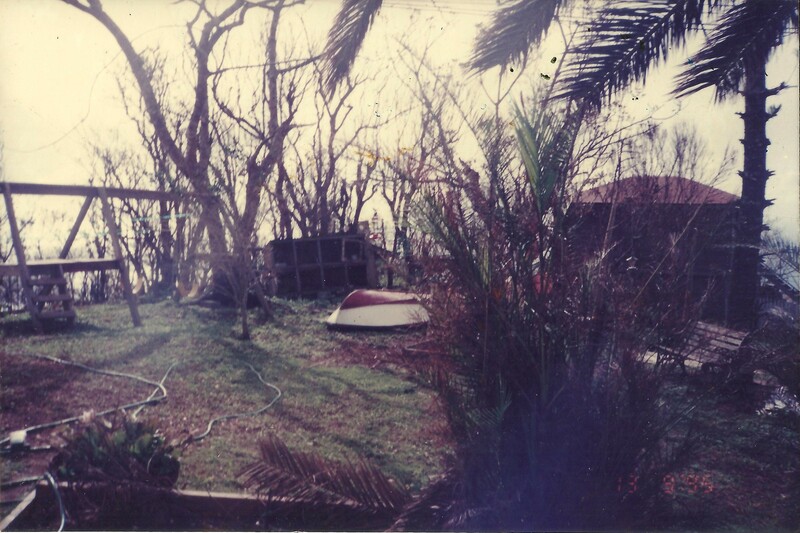 Saba was pounded in 1998 by hurricane George and then hurricane Lenny came around a year later and spent over thirty hours close to Saba and brought further destruction. Then there were a number of smaller hurricanes in between. Hurricane Hugo in 1989 started the new trend towards many hurricanes. Saba had been touched by hurricane Donna in 1960 but the main structure of that hurricane had been to the North over St. Martin and Anguilla. I was on St. Martin the day before hurricane Donna and came over to Saba with the M.V.”Antilia”. The weather was so calm no one would have thought that a powerful hurricane was on the way. Many years later with hurricane Luis the same thing happened. We took a boat to Saba leaving our son Chris behind who was on his way to go to school, but a few days later he showed back up on Saba as a refugee after having gone through the worst of the hurricane at Pointe Blanche. School would have to wait for a while. Before that Saba had a hurricane in 1932 and one in 1928. For some strange reason the one in 1932 was called by the locals a cyclone as if that word had been invented on Saba. There were also two deaths in that hurricane and some strange things happened where a house in the village of St. John’s had been lifted up and deposited in The Bottom. In Windwardside on the “Brest Place” in the hurricane of 1890 a man who had built his new house claimed that no hurricane would be able to damage that house of his. That same night a hurricane came and he and his hurricane proof house were lifted up and never seen again. Speculation was that the house with him in it had been deposited at sea on the Saba Bank. The view from my home on The Level a few days after the passing of hurricane Luis. The Great Hurricane of 1772 had devastated the West Indies with thousands of victims. On Saba most of the houses were destroyed including that of one of my great-great-great-great grandfathers Jacob Vlaun. As a result he was forced to live in a cave in the cliff below Hell’s Gate just below the home of Robert Hassell. To this day the cave is known as Vlaun’s cave. I regularly use this information to infuriate people who come to Saba as new settlers and who think that they can drive us off our own island which has been part of our family history for over four hundred years. So this example is just a reminder to those new settlers who are an annoyance to us that we have been here for a long time and our children and their descendants will also point to Vlaun’s cave as a source of last retreat for us when things go bad. 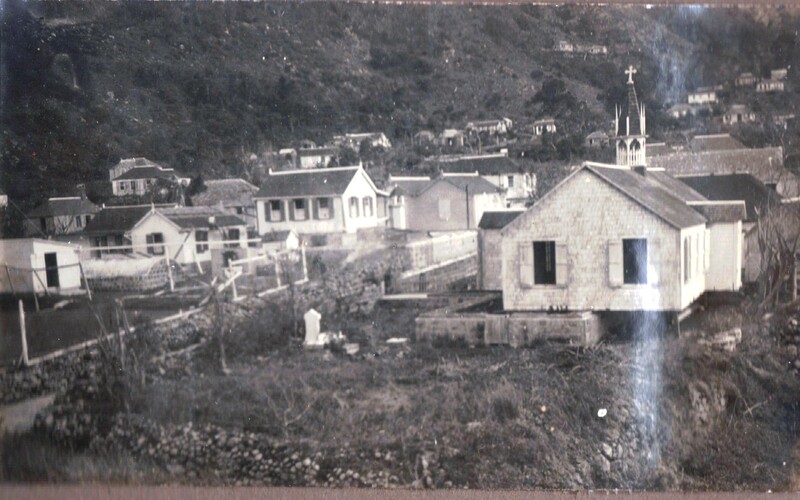 In that same hurricane stories handed down to us by our ancestors were that the church doors from the Dutch Reformed church on St. Eustatius had been found around where my house is built on Saba eighteen miles away. My backyard in The Level after hurricane Luis. My home is just under two thousand feet and so at this altitude the winds are amplified because of the height. Hurricane Luis and the others mentioned in the last years have been well documented in advance so that people were aware of the dangers which were on the way. Not that some people paid attention mind you. I remember when hurricane David was approaching the islands that the local radio station on one of the islands to the South most affected was playing music as if they were in the middle of a carnival. Nowadays with all the weather sites on the Internet and on television there should be no excuse for not being prepared. Sometimes we prepare too much and like Danny the system passes us by without even a drop of rain so sorely needed. Few people who are not living in the hurricane zone are aware of the amount of work which is involved in getting prepared for a hurricane and then after it has passed even if there is no damage. Putting up and taking down shutters and clearing up around your property is hard work and the tension of what is to come does not make it any easier for people. Back in the nineteen fifties in a funeral sermon Father A.L. Cromie of the Anglican Church told his congregation that not everything could be blamed on the works of God. He said you are living on a volcano which can erupt and in the in the worst of the hurricane zone where you can get a hurricane at any time. His advice was seeing that those examples were a danger in themselves, not to add to that danger by reckless driving on these mountainous roads, consuming too much alcohol and taking all kinds of other risks which can shorten your existence here on earth. If he came back now he would surely see a great need to add on to that list of dangers of living on a volcano in the middle of the hurricane belt. Before the internet and television, radio and all of that our people relied on signs in nature to prepare for a hurricane. It is claimed that the Kalinago Indians (called Caribs by the Europeans) by the movement of the waters could tell days in advance if a hurricane was coming and from which direction. They were more friendly with the French at the time of one of the great hurricanes and they warned them to move their fleet to another location and the British fleet on its way from Barbados heading North lost all of its ships and many of its soldiers as they did not have access to the information the French had and they did not take shelter. 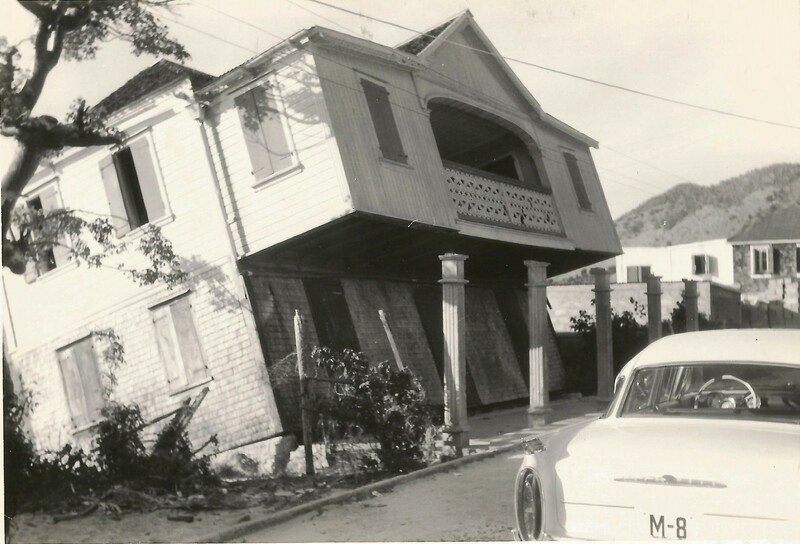 A house in Grand Case, St. Martin after hurricane Donna, September 4th, 1960. I can recall as if yesterday sitting with my two grandparents under the sea grape tree next to the church on Hell’s Gate. They were James Horton Simmons and his wife Agnes Johnson. We would be sitting there with my grandfather roasting sweet potatoes and smoked herring on an old coal pot with coals he had burned himself. This story, by the way, also drives the new settlers crazy as they do not have such stories to pass on to those whom they would like to fool as if they belonged here. Anyway “Horton” who had been born in 1867 had certainly seen his share of hurricanes, but he was the quiet one. The stories came from my grandmother who smoked an old clay pipe from time to time. Horton had a reason to remain quiet as his voice was so loud. Willie Johnson told me once that people farming in the Rendez – Vous thought there was a riot going on in the Windwardside because of all the noise, until someone came up to farm and told them there was no riot. It was my grandfather “Horton” cleaning someone’s yard and was only talking to himself. Once in a dry weather like now he had gone to get water at Spring Bay. The spring had been clogged up somehow by a dead land crab and was empty. “Horton” thinking that the spring had gone dry started howling in despair and the entire village of Hell’s Gate was in an uproar thinking something had happened to him until the men went down and realized that he was crying that all would die as there was no water in the spring. Hurricane referred to as a cyclone for whatever reason on September 26th, 1932, caused two deaths in the village of Hell’s Gate. The Roman Catholic Church in The Bottom was moved from its foundation. Saba manpower with some equipment provided by Dutch marines were able to get the church back on its foundation. It became a school later on and I went to school here from 1953 to 1955. Anyway my grandmother Agnes would tell me of the different signs they would notice. The yard fowls would start to cuddle up together and bury themselves in the soil, the livestock would make strange noises and there would be a series of drizzles before the bulk of the rain would start up. There would be crops to harvest and the animals to be taken care of and then at the very last moment the houses were closed up. My grandparents’ house was just a small two room affair so just a few windows to be closed and then wait out the storm. With hurricane Luis it was something like Donna in 1960. The bulk of the bad weather was in the North. However the storm was so large that we did get hurricane force winds here on Saba as well. And for the first time I experienced the eye of the storm. It became so calm that the neighbours and I were out in the street checking to see what was going on. We suddenly realized that the eye of the hurricane was so large that we should get back into our houses for shelter as the worst of the weather was still to come. And it did come. Hurricanes can come anytime of the year. There was one on March 8th, in 19808 I believe and a Saban schooner and its crew were all lost. The damage here was caused by the “Alice” hurricane of January 2nd, 1955 when 22 inches of rain fell in a 24 hour period. I don’t remember if it was hurricane Luis. Senator Aleppio Goeloe of Bonaire was on the phone with me when the telephone lines broke. Three weeks later when the telephone lines were restored the moment the phone was connected it rang. When I picked up the phone who else but Senator Aleppio Goeloe was on the phone and if I remember correctly he said: “As I was saying.” I said to him: “Have you been on the phone for the past three weeks?” It seemed like he had been. His call before the hurricane was just after my last radio interview with the pig story. You cannot imagine how many requests I would get for interviews while my wife and small children were trying to secure the house. It was useless to tell radio stations on Curacao and in The Netherlands that I needed time to secure my house. Now that I am no longer an office holder the calls for interviews are no longer a bother and yet somehow I miss the action and the excitement of reporting to the world events which were taking place. I hope though that we will get some respite from all the hurricanes we have experienced since “Hugo” opened up a hurricane lane with a lineup of yearly hurricanes threatening our livelihoods and our very existence. So in remembering hurricane Luis let us not forget all of those other hurricanes we have had to deal with going back to my ancestor Jacob Vlaun and beyond. One of those beyond ancestors “Daniel Johnson” known as “Johnson the Terror” had to deal with a severe hurricane in Port Royal Jamaica in 1660, so hurricanes are now lodged in our genes and provide us with bragging rights as to our long sojourn in the West Indies!! 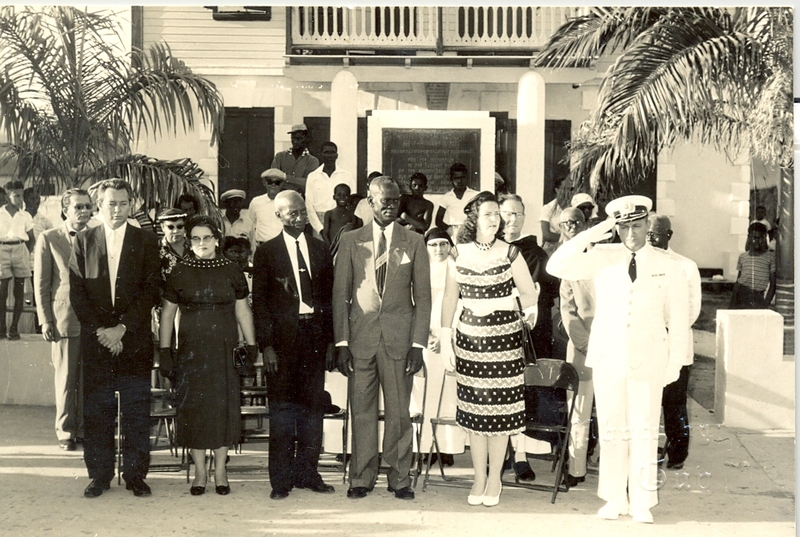 Commissioner Claude Wathey and his wife Miss Eva, then Commissioner Milton Peters, after that Island Council Member Lionel Bernard Scot, Mrs. Hertha Beaujon and Lt. Governor J.J. Beaujon. One morning I was driving my son Teddy to the Milton Peters College where he attended the VWO. I happened to mention to him the fact that I knew Mr. Milton Peters well and considered him a personal friend. Teddy could not believe that I knew Mr. Peters personally. He had assumed that Mr. Peters had passed away long before my time, but that was not the case. Commissioners Claude Wathey and Milton Peters with their backs to the camera with HRH Princess Beatrix 1955. Hubert Milton Josiah Peters (1891-1985) was born in the village of Cole Bay. As a young man, like many other Sint Maarteners of his day, he moved to the Dominican Republic and worked as a mechanic on a large sugar cane estate. He later (1929) moved to Aruba and worked there for many years in the LAGO oil refinery owned the ESSO standard oil company. Many times I heard him telling stories of his years in Santo Domingo and working on large sugar cane plantations in the area of San Pedro de Macoris and La Romana. There is where most of the workers from the Eastern Caribbean ended up. He was also very much about Aruba and the time he spent there working in the oil refinery. Many of our people from the Windward Islands went to work on Aruba starting in the nineteen twenties up to when Aruba got a separate status in 1986. When you check the phone book of Aruba you will still see many names of Windward Island’s origin. Some names you have to be careful with though. Everyone on Aruba thinks that Johnson’s Supermarket belongs to a cousin of mine. However on enquiry I learned that the Chinese owner did not think he would go far in life with his Chinese name so he simplified it by adopting the name of Johnson. The same goes for the Mayor of London Mr. Boris Johnson. I first thought he was a Russian but turns out his Turkish grandfather was the foreign Minister for the then Sultan and after the young Turks took over his country he moved to England and changed his name to Johnson. Commissioners Milton Peters and Claude Wathey with Lt. 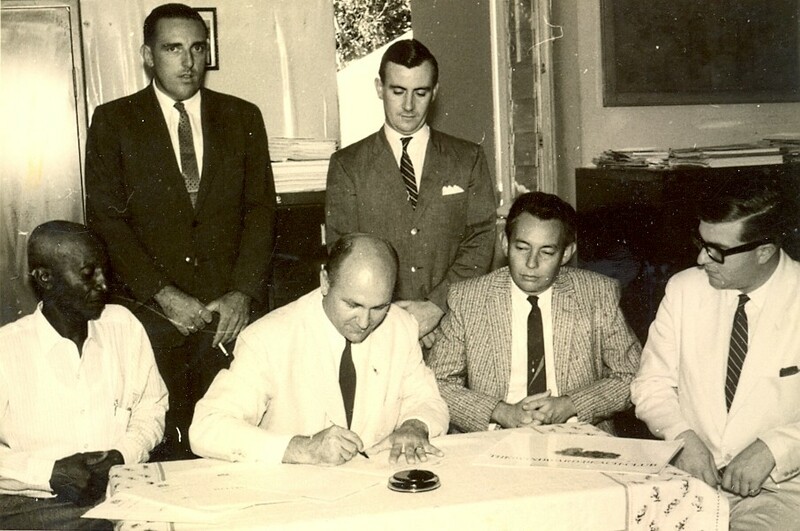 Governor Japa Beaujon signing an agreement. Now after my usual digressing let us move back to my friend Mr. Milton Peters. In 1952 he moved back to St. Maarten where he entered politics and served as Commissioner, and Member of the Island Council until 1971.In 1955 he was the number 3 candidate on the list of the Democrat Party and received 31 votes. He was already 64 years of age when he started to run for office. He was elected to the Island Council and became Commissioner for the Island Territory of the Windward Islands. In the elections for the Island Council in 1959 he ran as the number 2 candidate and he received 44 votes. One must remember that in those days the number of voters was limited. In the Island council elections on St.Maarten, the number of eligible voters for 1951 were: 599 of which 513 voted. In 1955 there were 614 voters and 561 voted. In 1959 there were 681 voters of which 624 voted and in 1963 there were over 900 voters and 856 voted. So as you can see there were not many voters living on the island at the time. In 1963 Mr. Peter’s votes grew and he received a total of 65 votes and was elected by the Island Council to his third term as Commissioner. In 1967 there were no elections and Mr. Milton Peters then 76 years old was elected to his fourth and last term as Commissioner by the Island Council. In 1971 at the age of 80 he retired to his home in Cole Bay but came regularly to town to visit with the new officeholders in government. Commissioner Milton Peters in the middle of the row of dignitaries. He was always very much about education. He was particularly in favour of the Dutch educational system and the advantages that were to be gained as a Dutch Territory in following the Dutch educational system. I remember having a discussion with him about the benefits of mother tongue language which was English, but he would counteract with a series of names of people who had gone to The Netherlands and who had done well. He always insisted on having the Portfolio of Education and visited the schools regularly. He would never pass a child on the road without finding out from him or her as to what they planned to study for. I must have learned that from him as I do the same thing when I give a young person a lift. Milton Peters did so much for education that when it was decided at the time to name the secondary school complex in his name there was only praise from the St. Maarten community for that decision. I always enjoyed a good relationship with him. Even when I was the sole opposition resident candidate against the ruling Democrat Party to which he belonged we remained friends. Whenever he met me he would say:” Boy, Will, you brave all right. I thought Cole Bay had all the brave people but it look like Saba has some too.” Mr. Christian Sorton used to tell me that the Cole Bay people were of the opinion that if you were not from Cole Bay you were not from St. Maarten. I was supporting a candidate from Sucker Garden against a candidate from Cole Bay on the WIPM party ticket in 1973 and “Kaiser” who knew the Cole Bay people from Aruba thought he would give me that bit of advice. And of course he was right. However the Cole Bay I am writing about has disappeared. Now Cole Bay is under one roof and I wonder how many authentic Cole Bay people there are left nowadays. 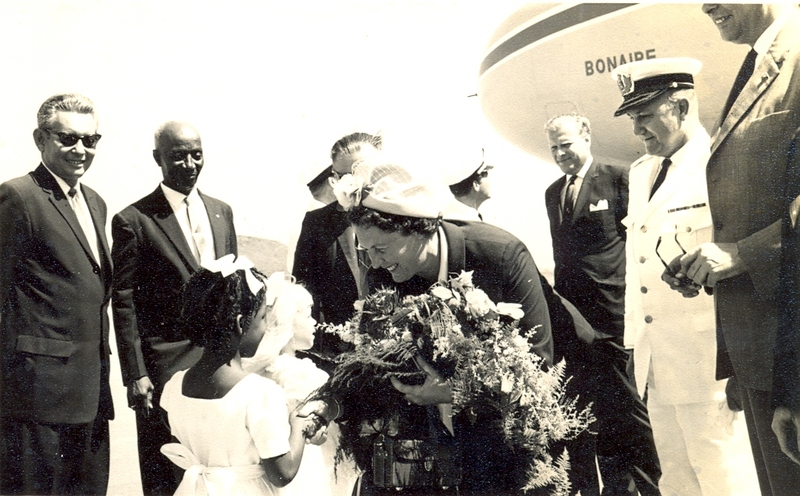 Commissioners Claude Wathey and Milton Peters and Governor J.C. Paap welcoming Her Majesty Queen Juliana at the airport in October 1955. He like many of the old timers did not take much to the idea of flying in a plane. Nevertheless in connection with his position as Commissioner he was obliged to fly. Senator Kenneth van Putten used to often tell me the story of how once he was flying with Mr. Peters back to St. Maarten from Curacao. Mr. Peters called over the stewardess and gave her specific instructions that due to his fear of flying that every fifteen minutes she should bring him a shot of whisky even though he was not a fan of drinking. Together he and the stewardess figured out how many drinks that would be. When the stewardess figured out that the plane would be on the ground when the last shot of whiskey was due, Mr. Peters exclaimed “Girl, after the landing, only then I will need a shot to calm my nerves. Bring it on whether in the air or on the ground.” And to her credit the stewardess complied. I also remember once being at the airport with Claude Wathey and Clem Labega. Claude was travelling somewhere. Someone from the office came with money for Claude to go with. However the document was only signed by the Lt. Governor and the person said that he could not locate Commissioner Peters. Clem knew that since I worked in the Receivers Office I, as a sort of hobby, had practiced all the signatures of the important people on St. Maarten. Not that I intended to defraud anybody. In this case it was an emergency. No credit cards back then and the flight was already on the ground. Clem turned to me and said “Johnstone do a Milton Peters for me and I guarantee you will not get locked up. So I plumped down the signature with the shaky hand of a person of age. When Claude saw the signature I have never seen him laugh like that ever. He kept staring at it and said: “Boy, Will you are dangerous, that is Milton Peter’s signature all right.” So as you can read in an emergency extraordinary solutions are needed to solve problems and they need not be done for illegal purposes but to solve an immediate and urgent problem. Commissioners Claude Wathey and Milton Peters at airport welcoming one of the Dutch Princesses. These personal stories are for reflection only and are not meant in any way to demean the man or to take away from his outstanding record. Despite his advanced age, starting out in politics at the age of 64 years and ending it at the age of 80 he deserves much credit. Some people overstay their time in government and accomplish nothing. They fall in the category of the Oliver Cromwells message to the British Parliament when he told them: “You have overstayed your time, and have accomplished nothing. 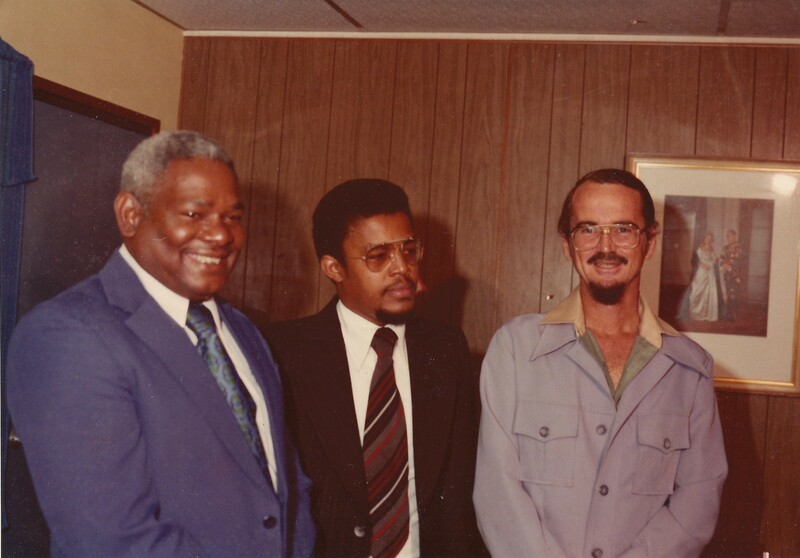 In the name of God, go!” Mr. Peters was a team player with his party leader Senator Claude Wathey. Despite his advanced age he was always pushing hard for a better education system on St. Maarten and the building of more schools. He should always be remembered for his great interest in education. “Mrs. 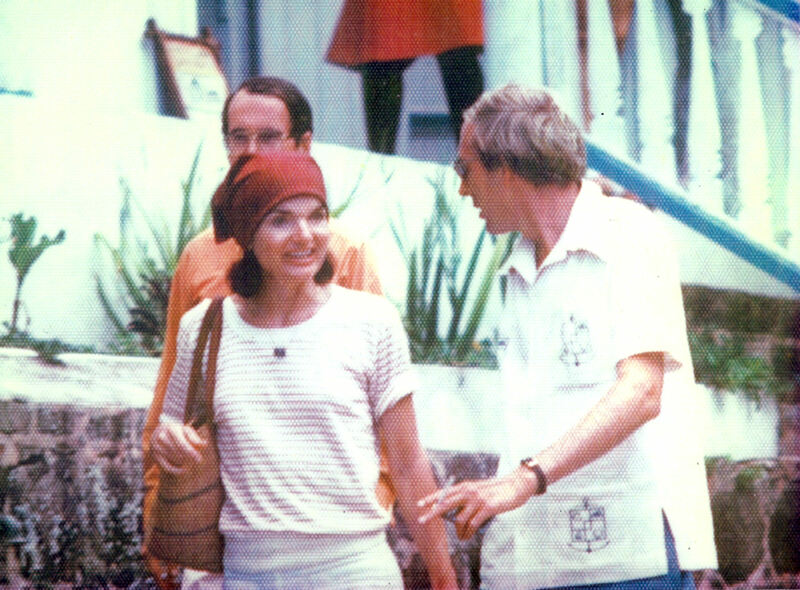 Jackie Kennedy-Onassis, accompanied by her son John Kennedy, her daughter Caroline Kennedy and nephew Mr. A. Radziwill visited Saba. The Kennedy children stayed overnight at Captains Quarters Hotel. Mrs. Kennedy went back in the afternoon. I drove her around. She came to my home in The Level and had iced-tea and a chat with Lynne. As there was a lot more to the story than just that let me share the experiences of that day with my readers. The right Honorable David Lionel Henry Donker, father of among others Nurse Lizzy Hassell-Donker. He is also the uncle of Mrs. Carmen Simmons-Nicholson and her deceased brother the Hon. Max Nicholson former State Secretary, Commissioner etc. Mr. David was full of stories of his days as a young boy growing up on the island of St. Eustatius. When he passed away the family asked me to do the eulogy. He and I became great friends in his last years. In October 1984 after some years on Curacao he returned to Saba and I wrote about him at the time. Subsequent to that and until I did his eulogy on March 12th, 1997 in this article, I will follow up on his life story. I wrote in 1984: “Now that he is back on Saba, we were finally able to catch up with him for an interview. Just two nights before he had put on a performance for Christian Action week in The Bottom, and many, especially the younger people, were quite surprised at the talent of Mr. David Lionel Henry Donker, also known fondly as the old “Shoe Doctor”. He was born on Saba on April 21st, 1905. His mother was Adelaide Donker of Saba and his father was Jeremiah Leerdam of St.Eustatius. As a young man his father had joined the Dutch navy, along with five other boys from St.Eustatius. The others only stayed for six years, but Jeremiah worked as a cook for 22 years and 9 months. He worked on the Man-of-Wars H.M.S. “Tromp”, “Sumatra”, “Van Speijk”, “Brommel” and “Queen Emma”. He retired because of illness. He served in Surinam but also in the East Indian islands of Sumatra, Java and Celebes. Jeremiah Sr. also left a son behind on Java and Mr. David had contact with him in former years. David’s brother the late Jeremiah Leerdam who died in a traffic accident while working as a policeman on St.Maarten in the nineteen fifties was named after his father. Jeremiah Sr. died in 1927 at the age of 71. His father George Henson lived to be 108 years and four months, and George’s father poor fellow, he died young, he only made it to 104. Mr. David was a frequent traveler among the islands, by schooner and other means of transportation. He told me that once he went on one of those large four masted schooners with Saba Captains carrying asphalt from Trinidad to the United States. They were all from the old white families of the Bottom and one of them gave him a “lift” with the schooner to the States and back to Saba. He lived in what is known as the “North” on St.Eustatius. As a young boy David lived between Saba and St.Eustatius. He had three brothers and two sisters, but his father had 16 brothers and 7 sisters. George Henson must have carried an umbrella around, as with 23 children by different women he was bound to “take up a bit of night dew”. In the days of David’s youth the people of St.Eustatius were moving out to Bermuda, the United States, Curacao and then to Aruba. The old Statia families were replaced mainly by people from St.Kitts and the other former British colonies. Mr. David started out in school here on Saba under the nuns Sister Euphresine and sister Georgine. On St. Eustatius he continued under Sister Vitalis. These were all Dutch nuns. Sister Vitalis died in the diphtheria epidemic which struck Statia in 1915. On the day she died four other people died. A total of 108 people died. Dr. Fernandez was the physician there at the time. David says he remembers vividly that the bells were tolling every morning, and funerals had become commonplace. The population of Statia then was 1431. His sister Polly Geraldine (mother of Mr. Max Nicholson and Mrs. Carmen Simmons born Nicholson) was afflicted with the disease but she was among the lucky few who survived. On the 25th anniversary of the WIPM party Mr. David was honored by the party for his contribution to the first Island elections on Saba. He was not a member of my party, just a good friend. David left school at the age of 11 as was customary in those days. We must say he left school in body but not in spirit. At heart Mr. David is still a schoolboy and can recite in perfect Dutch and pull out of the top of his hat, the verses and poems taught to him by the Dutch nuns so long ago. He can even remember by heart some of the Dutch speeches made during the Second World War. The trade, for which he later became widely known, namely that of shoemaker, was acquired at the age of 13. He learned the trade in three months from a Mr. James Henry of Goodwill, Dominica. 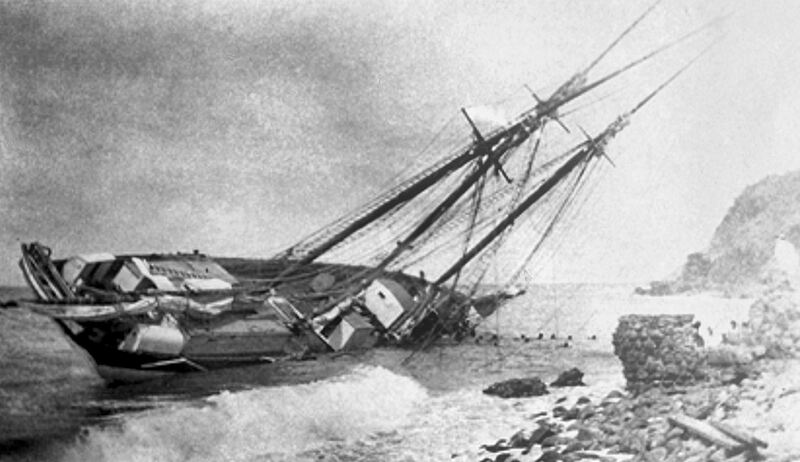 Mr. Henry had come to St.Eustatius on a boat, but it got destroyed and it remained on the island. David says that he worked along with Mr. Henry even after he fully mastered the trade, and even though he did not get paid one cent. He did this at the insistence of his mother who kept reminding him that one day he would be a man and would need some kind of trade. After that he learned carpentry with Mr. Milton Timber and also did some farming while he remained on Statia. 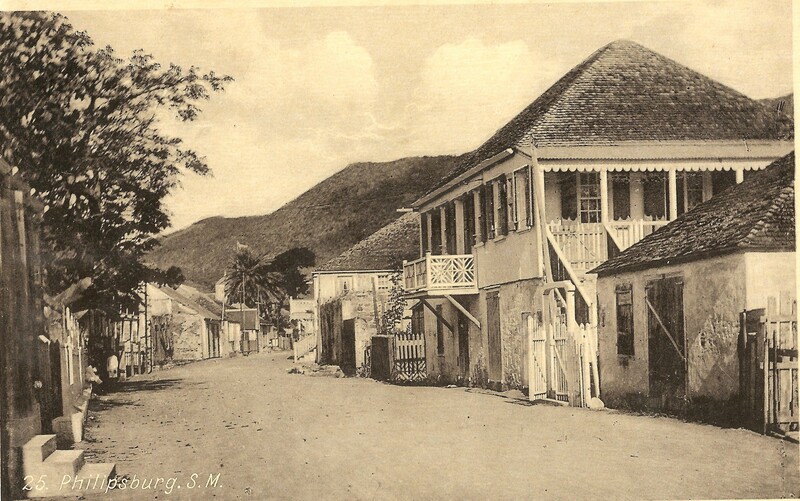 He then moved to Saba, and lived in the Pfaffhauser house at the Gap which he rented from Capt. Gilbert Simmons, who used to own the home across the street from it which now belongs to the family of Mr. Nederville Heyliger. David got married at the age of 22. His wife Florestine Simmons was the daughter of Caroline Ellory Simmons and Hamilton Simmons. They had 6 children (5 sons and 1 daughter). The daughter, better known to all as “Nurse Lizzie”, is Mrs. Elizabeth Hassell. She said that her father was proud to be a shoemaker. He was also proud of his five sons. They would help to deliver shoes all over the island. And when she was a little girl he would carry her on his shoulder when he was visiting his customers. As a young man he used to play the guitar and he loved to sing. 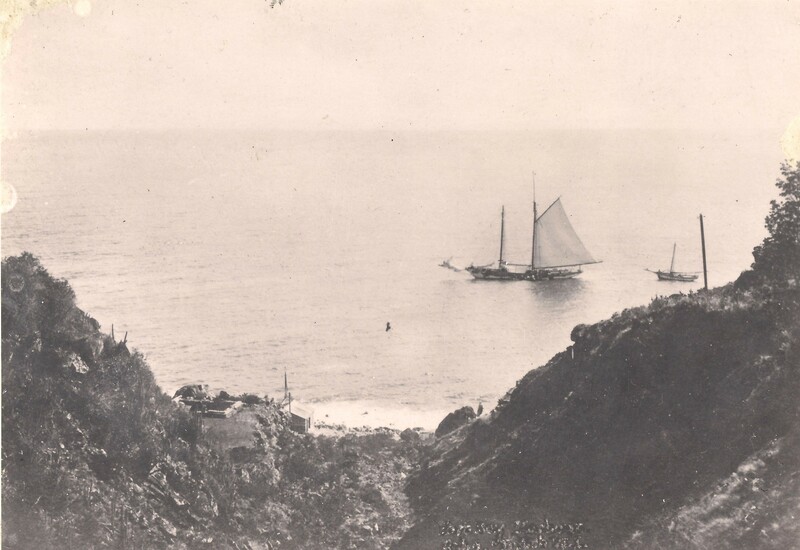 The schooner E.Starr Jones with Captain Lockland Heyliger of Saba with which Mr. David caught a “lift” to New York and back. This and other schooners would transport asphalt from Trinidad to the United States and the Saba captains would make stops at Saba to pick up new crew members and to visit their families here. After he got married he went to Curacao to look for different work for a change. 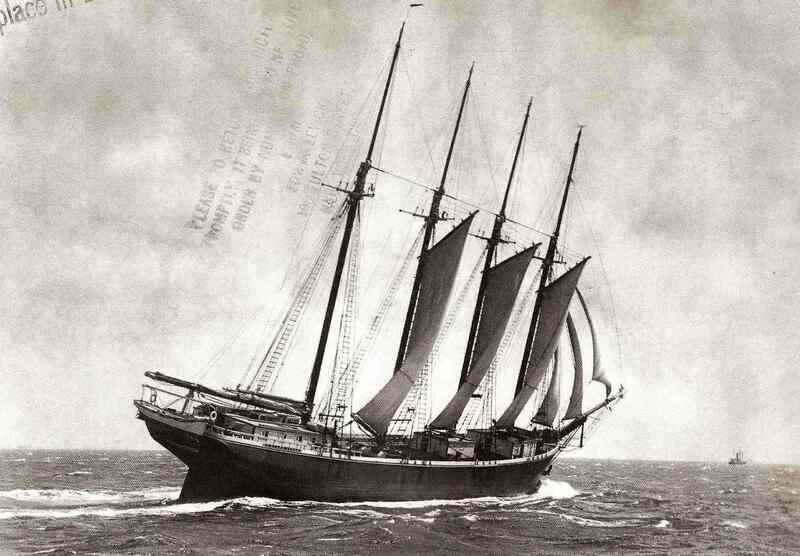 He went with the schooner the “Three Sisters” and remained on Curacao for three years. He sailed for a time on the Red D. Line on the steamship “Carabobo” with Capt. Morris. This ship carried freight and passengers. He also sailed with Capt. Evan Simmons of The Bottom. 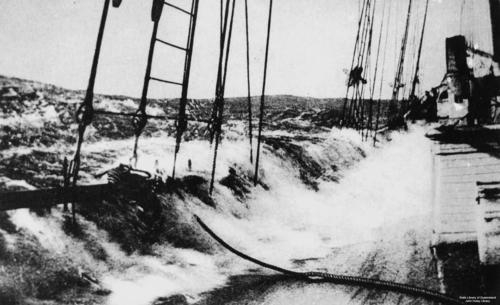 The ship was caught in a gale in the Gulf Stream off Cape Hatteras, and it was a terrifying experience. The ship used to run between New York, Puerto Rico, Curacao and Venezuela and then back again via the same ports. 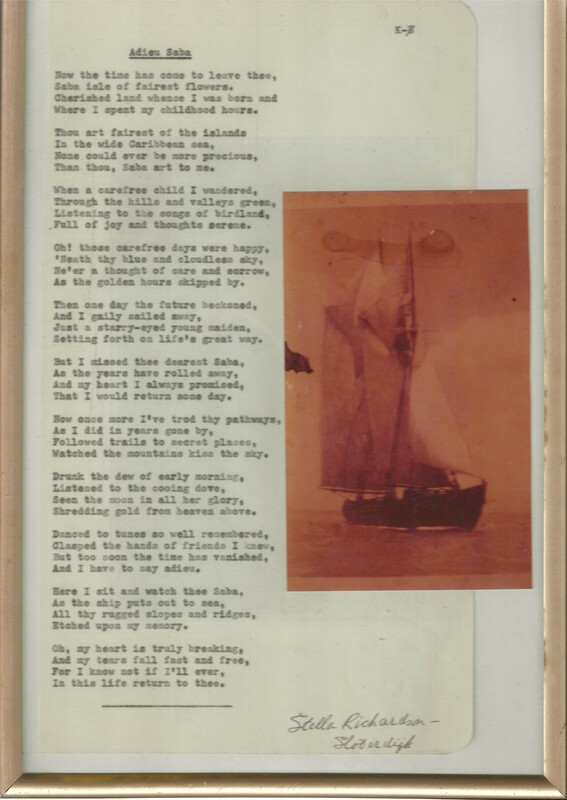 He also remembers going to New York on the lovely four master schooner the “East Star Jones” with Captain Lockland Heyliger of The Bottom. The schooner would transport asphalt from Trinidad to New York and the Captain would stop in at Saba to see his family. He would take friends from Saba to New York where they could shop and on the way back to Trinidad he would drop them back off here. After his years at sea David then returned to Saba, and made his living and raised his children from shoemaking. He also farmed a little around The Bottom. Only occasionally he traveled out to St.Maarten and St.Kitts to get leather. He would consider doing shoes again, but there is no way he can get the correct leather for half-soling shoes. When the islands were granted autonomy Mr. David entered politics. As a boy I remember him coming to the house campaigning. I can hear him now telling my mother;” Now Miss Alma, your husband Johnson is a good mason, but ignorant of politics. Let your Dava explain you how the situation is.” And he would go into a long and complicated defense of his views on the politics of the island back then. My mother was not impressed with his oratorical skills. She would say:’ I don’t care what they say I am voting for Matthew (Levenstone), he can get things done and my sons need jobs.” But Mr. Dava never gave up and kept going from house to house giving his version of the “situation” on Saba. In the 1951 elections three political parties took part in the elections on Saba. Mr. Donker was the number 2 candidate on the blue list (D.P.). He received 84 votes which were the most votes of any candidate on Saba at the time. By comparison these are some of the candidates who took part in the elections and the number of votes they received. Kenneth Peterson 81, Herman Hassell 45, Lamber Hassell 35, Rupert Sorton 23, Matthew Levenstone 12. In the 1955 elections Mr. David Donker was the number one candidate on the red list (D.P.) which party had changed its colors and he received 54 votes. The role had reversed by then, and Mr. Donker because he was not elected as deputy the first time fell back to number three vote getter. He took part in the 1959 elections on the N.V.P. list as the number 2 candidate. By that time the D.P.was firmly entrenched, and he only obtained 22 votes. After that he withdrew from active politics, and gave his support to his nephew Mr. Max Nicholson, who became Commissioner between 1963 and 1971. His wife died in 1970 in Curacao and is buried there in the church cemetery at Botelier. 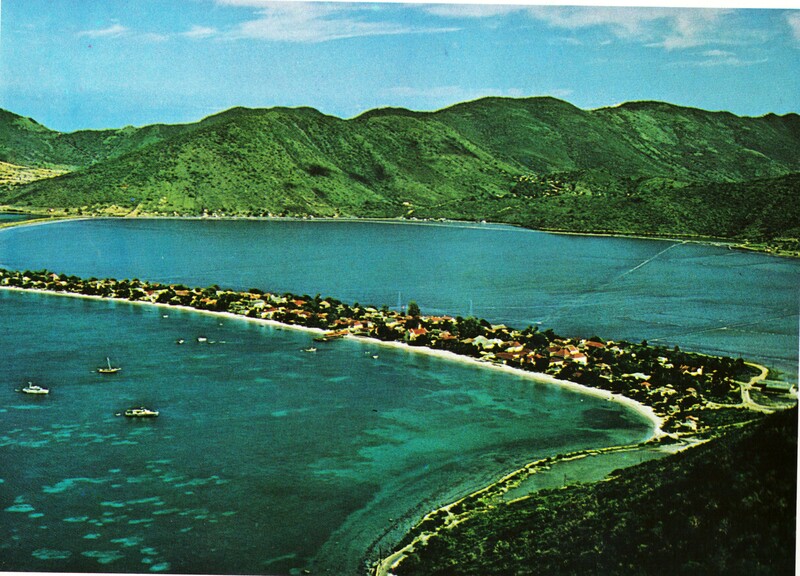 In 1972 Mr. David moved to Curacao and lived between there and Aruba. He is back on Saba now and we hope that he will stay around and that some of our young people will listen to him and learn how to live. 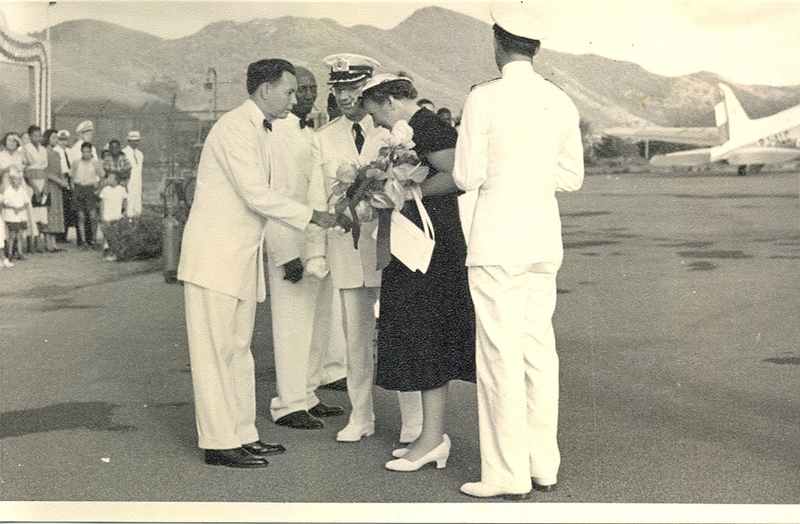 On the left Island Council Member David Lionel Henry Donker in the greeting line for HRH Princess Beatrix then Crown Princess of The Netherlands on her visit to Saba in 1955. Since then she has visited Saba many times. If David follows in the footsteps of his grandfather and great-grandfather then he should be around with us for a long time to come. That was 1984. On April 30th, 1993 Mr. David was granted a medal in gold in the Order of Oranje Nassau by Her Majesty Queen Beatrix. On that occasion at the home of the Lt.Governor I made a speech honoring him. He was proud that he was a shoemaker. He never told anyone that he had once been the biggest vote getter on Saba. No he would tell them that he was a “Shoemaker”. He died on March 10th, 1997. He was nearly 92 at the time of his death. The St.Maarten Guardian in its edition of March 12th carried an article by Dave Levenstone who said: “On several occasions I had the opportunity to sit with Uncle Dave and listen to his stories of past campaigns. He was a very good friend of Mr. Chester Wathey of St.Maarten and a very strong supporter of Senator Will Johnson and his WIPM party and he will be missed by all Sabans. Uncle Dave will be remembered on Saba for his many talents and especially for the way he brought his message door to door to the people of Saba. He was never afraid to speak his mind and he would very often sing a song to his audience to get his message home,” said Mr. Levenstone. My friends in the Hazel family. Mr. Melford Hazel standing in the yard of the Sea View Hotel. Postcard by Guy Hodge. I had promised myself for quite some time now that I would visit my friend former Commissioner and Act. Lt. Governor Sam Hazel. On Friday November 6th I finally had enough free time to try and find his house. Sam had been having serious health issues and I wanted to visit with him. Drs. Eugene Holiday who is married to one of Sam’s many daughters gave me instructions as to how to get to the house. I remember years ago at the old airport Sam was going to New York with the wife and children. He was over in the bar area with Allan Richardson, Clem Labega, Claude Wathey, myself and a host of others. When the call came we all had a good laugh. There was tough Sam going on vacation with his wife and a host of pretty little daughters all dressed the same. We were all teasing Sam and it was a real treat to see tough image Sam heading out to the plane surrounded by all those cute little children all excited about going to New York. In that moment you got a complete different picture of how a man is brought low or raised to special heights when surrounded by the female of the species. Anyway I thought I was following Drs. Holiday’s directions and took the road after Mr. Piasco’s former grocery. As I drove up the road I thought to myself, this is not the road I would expect my friend Sam to retire on. Driving all the way to the top I found a place to turn around. The few people I met on the road knew they were on St.Maarten and that was all. The next street I decided to enter looked more like where I expected Sam to live. Symbolic to St.Maarten, local wealth and foreign poverty lie within a stone’s throw of each other. On Sam’s street there were nice homes and gardens all the way to the top. Not one name on any of the gates though. No one even to ask directions from. Finally I saw an old man. From the moment I asked him if he knew where Sam lived, I realized he was an old Haitian national. No luck there, so I decided I would have to leave the visit for another day, as I did not even have a phone number which I could call. Busy traffic day on Front street in former times. The following morning I had a breakfast appointment at the Chesterfield restaurant. The first person to come and greet me was my friend Sam. I told him my story and he informed me that he lived in the house of his late uncle Edward. Sam was looking great but he confirmed to me that he had been in a bad way. 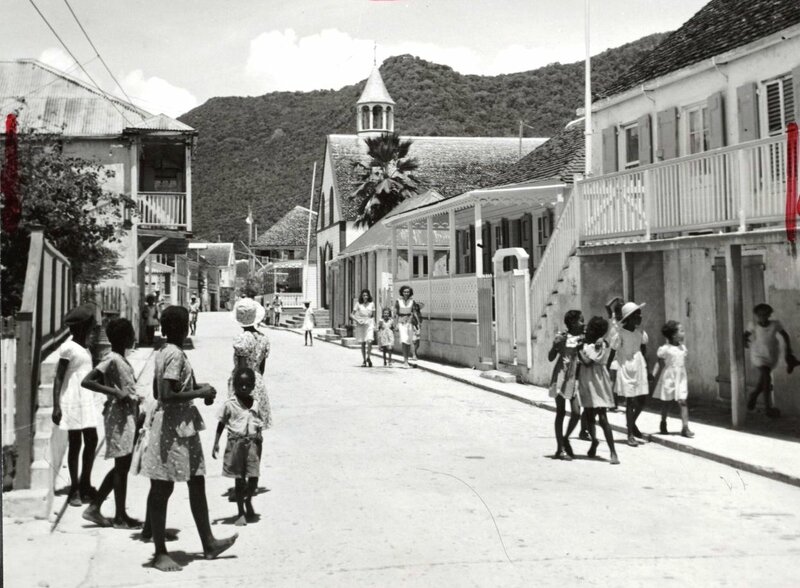 Beautiful shot of Philipsburg from the nineteen fifties. I remember once in New York my cousins who lived around the Aquaduct racetrack took me there to see the races. Among the eighty thousand or so people attending the races I saw a distinguished looking man who reminded me of someone. I decided to take a bold step, walked up to him and asked if by any chance he was related to Mr. Melford Hazel on St.Maarten. He looked stunned for a moment. I told him who I was and that I lived on St.Maarten. Turns out it was Edward brother of Melford. This was in the nineteen sixties. In later years I met him often and each time he would comment on how observant I was to pick him out of such a large crowd at the race track. 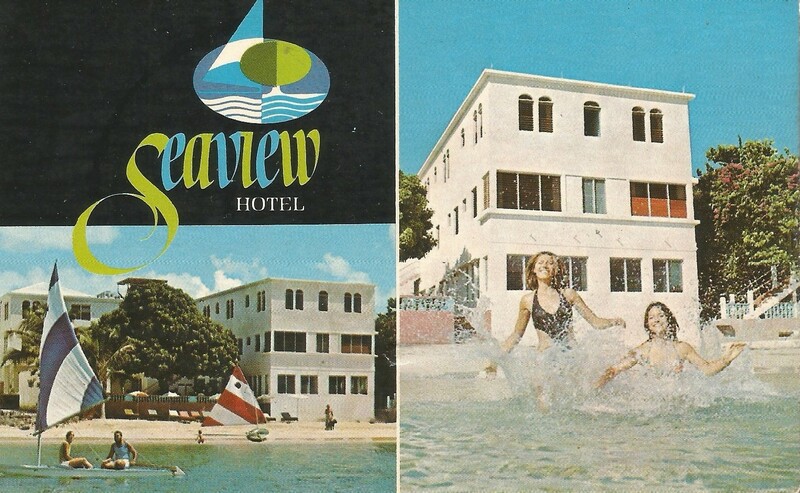 Postcard from after the rebuilding of the Sea View Hotel late nineteen sixties. I had met Sam in the 1950’s when I was staying at the home of Miss Browlia Millard on Backstreet. Sam lived on the other side of the street just a bit up the road. Teacher Frank Hassell was teasing him about the fact that he was on one political party running for office while his mother was on the list of another political party. In 1969 I ran for Senator against the all powerful Claude Wathey and the Democrat Party. To everyone’s surprise I did much better with my URA party (which Mr. Vincent Astor Lopes of St.Eustatius promptly named the United Russian Alliance), than generally expected. After the elections I was persona non grata to many people. No one wanted to be associated with me. No room at the inn so to speak. And no one wanted to be caught renting me an apartment. One day I was at the old airport bar and to be honest I was depressed. I needed somewhere to park up my suitcase. The rest usually took care of itself. Sam who was then Commissioner for the DP came up to me and in a joking manner asked if I had my suitcase packed. The last place where I was living was in a small house close to the R.C. Church in Simpsonbay. The old couple who rented to me panicked when they learned that I was the Will Johnson who was against Mr. Claude. A well-known official close to the family intervened on my behalf and I was allowed to stay there till the end of the month. I could have gotten refuge on the French side. However I thought that I would be removed from the census and lose my government job in the process. Word seemed to have gotten around. I thought Sam was making fun of me and I used my best cuss words at him. I should have known better. He said “My father sent to get you.” So we went by my place picked up my suitcase and went to see his father the legendary Melford Hazel Sr. He informed me that he was putting me up at the Sea View Hotel and he wanted to see who would remove me out of the Sea View Hotel. He knew my financial circumstances. I was making something like fls.212.—a month at the time. Even though he objected to my paying anything for the room, I tried to keep up with the bar bill every month. Sometimes Allan Richardson or Clem Labega would intervene in that department and I would be told that my substantial bar bill had been paid. My room was above the Taj Mahal store. I would love to tell friends that I lived in the Taj Mahal building. My room became the headquarters for visiting Sabans, and was the Editorial headquarters for the Labour Spokesman. Sometimes when Alrett Peters would be there together with me going over what to put in the paper, Sam would come up and have a friendly chat. Mind you the paper and the Union it represented were both on Sam and the D.P.’s case every issue. But such was the relationship. In looking back I can proudly say that among those who voted for me in 1969 were people like Alec The Butcher (Richardson) and a substantial amount probably of his forty eight children, also Melford Hazel, Aubrey Cannegieter, Elias Richardson and many of the old guard national heroes now fondly remembered, Alrett Peters too of course and his father as well. Philipsburg from the nineteen fifties. I lived in the Sea View Hotel for over two years and no one could come there and take me out. So man when I heard that Sam was not well, I felt guilty that I had not been to see him. Melford Augustus Hazel was born in Cul-de-Sac on July 3rd 1898. As a young man he worked in the Dominican Republic. He later moved to the United States. After working there for a number of years he returned to St.Maarten in 1927 where he started a grocery store on the Backstreet. He always told me that he was ahead of the local merchants at the time as he brought a car along with him and made home deliveries. His wife Miss Weez (Elouise York) also had a bakery. Mr. Frank Hassell reminded me of how delicious that hot bread was in the morning hours when Miss Browlia would walk across the street to get them for breakfast. My St.Maarten stepfather or better put Saba’s stepfather Mr. Frederic Froston (Taxi # 16) would be there by bakery sometimes till 2am playing cards while Miss Weez was getting the bread ready to bake. Such was life on the quiet Back street back then. In 1951, when the islands achieved autonomy, Mr. Hazel entered politics. He served on the Island Council until 1955. He was always outspoken against the free-for-all-development which took place on St.Maarten in the last years of his life. Left to right Act. Lt. Governor of the Windward Islands Commissioner Samuel Hazel, Administrator Oswald Bell of St. Eustatius and Administrator/Commissioner Will Johnson of Saba. At a ceremony in Spritzer& Fuhrmann N.V. in which they gave donations to several charitable organizations of the three islands. I received a call one day years later informing me that he was not doing well. I took the plane and went to the home on Backstreet where he lived. As a young boy growing up in Cul-de-Sac he had a dream of one day becoming a businessman in Philipsburg. He realized his dream and eventually became one of the most successful businessmen that St.Maarten has produced. I expected him to be in bed. Instead his daughter Mrs. Helen Lake (wife of Joseph H. Lake Sr.) directed me to the garden below. There he was, looking pretty good, relaxing on a day bed with one of his grandchildren sitting talking to him. The yard was full of sweet potatoes, sugar cane, pumpkin vines and the things which grew well in the sandy soil of Philipsburg. I thought I would make his day by opening the conversation with “And Claude tells people that you can’t do any farming on St.Maarten.” We never discussed the state of his health. We talked politics. Somehow I thought he would have been around forever. It was not too many years before that I had seen him under the gennip (kennip) tree on the Sea View Hotel Patio holding a small baby. When I asked him he smiled and said “This is the one for the girl from Anguilla.” I thought how nice of him to be holding the maids baby. That is until the bartender explained me differently. I would not say that he had caught up with my friend Alec the Butcher, but it must have been some fun trying to be number one in a race like that. 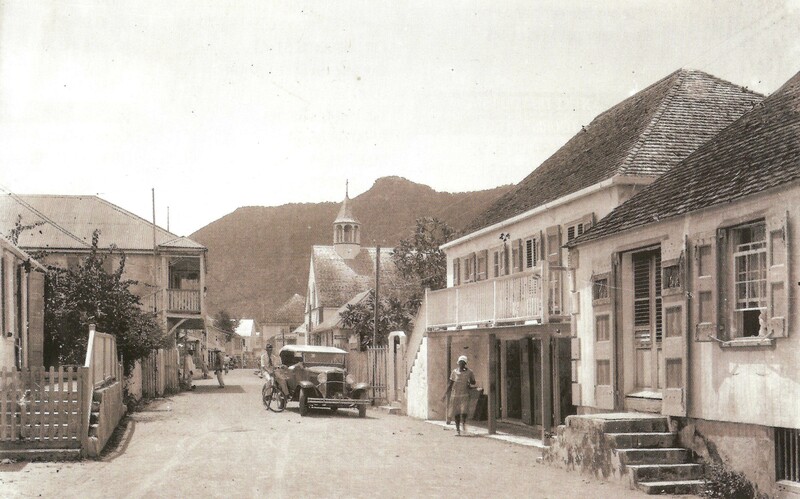 Front Street, Philipsburg in the nineteen twenties. The first two story building belonged to Mr. A.C. Wathey and it burned down in the forties, and the second one is the home and business of the Nadal family which was later sold to Mr. Melford Hazel and became the Sea View Hotel. At the same Sea View Hotel years later I was sitting at the bar with my brother Guy (Brother Sam of Lions Fame). Two young girls walked in and sat at a table. I informed Guy that he was on his own and I walked over to the table where destiny took me in its wake and thirty six years later one of those girls is still making all the difference in my life. Sam I will try and pass soon and tell you about Miss Jean’s rooster which used to walk boldly across the street and peck out the bags of corn which Miss Weez had in the store. What a commotion! We will reminisce on the formula your mother used that made such tasty bread which I still remember more than fifty years later. And by the way! If I did not say thank you before, this is my way of thanking you, your father and the rest of the Hazel family. *This article is from six years ago and was first published in The Daily Herald’s “Weekender”. 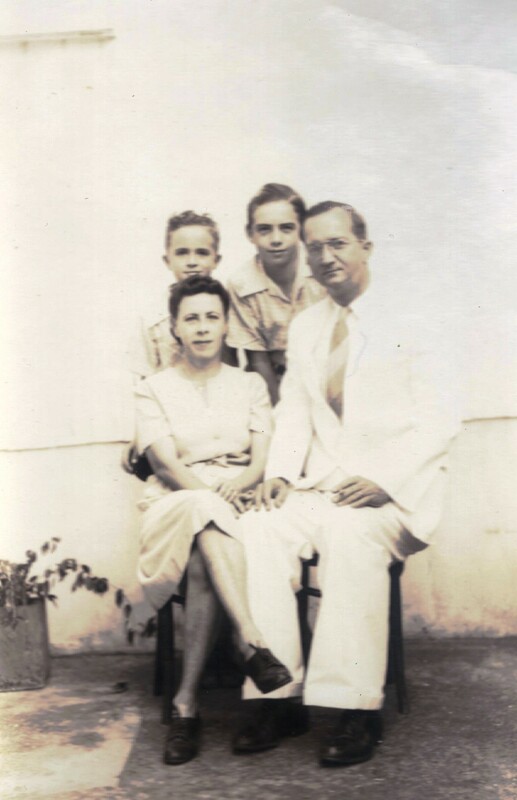 Administrator Max Huith with his wife Cynthia Labega and their two sons who later both became doctors. 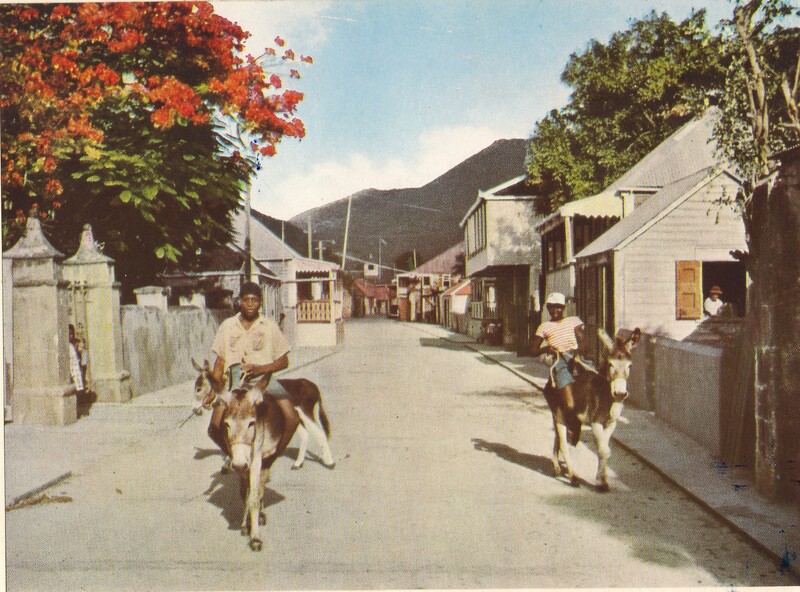 In the past century most government officials on Saba were natives of Sint Maarten. Radio operators, Police officers, teachers, and even Administrators as the position of Island Governor was referred to between 1919 and 1983. As the three Dutch Windward Islands had one Lt. 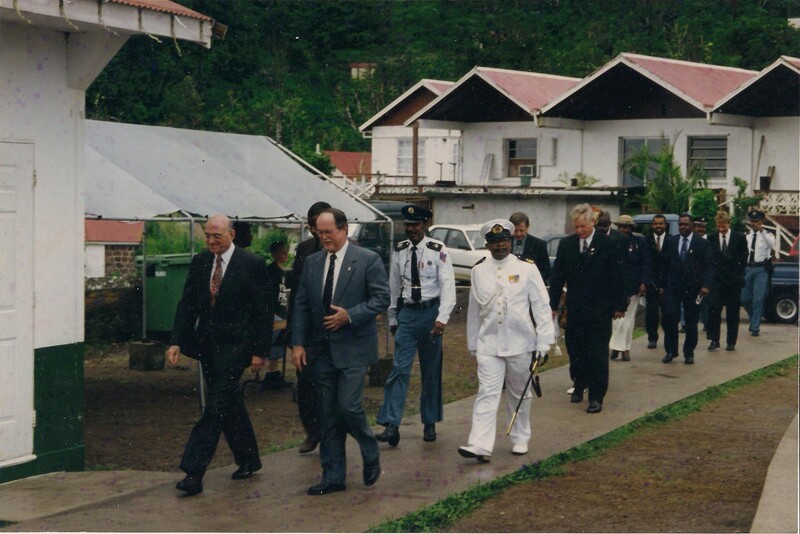 Governor, his representative on Saba and Sint Eustatius during aforementioned period carried the title of Vice Lt. Governor and later on Administrator. The term for that position was usually two years but could be extended to more. 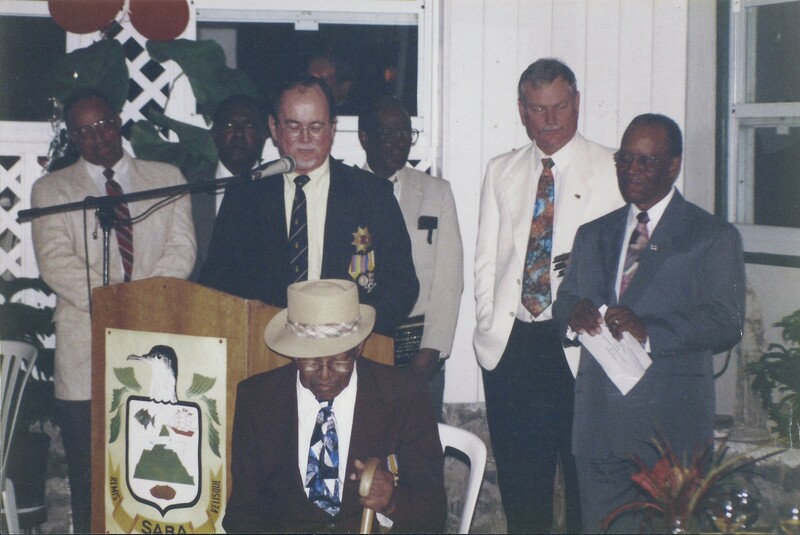 Among the St. Maarten born Administrators of Saba were Ernest Voges, Max Huith, Ludwig Reginald Carty, Walter Granville Buncamper, Carol Labega, Reinier van Delden, Joseph Emanuel Richardson and George Larmonie. We are mentioning native St. Martiners only. There were others living on St. Martin from Holland and Curacao who were also appointed from over there. The house at the bottom of the frame around the middle of the photo was the family home of Mr. Max Huith where he was born. 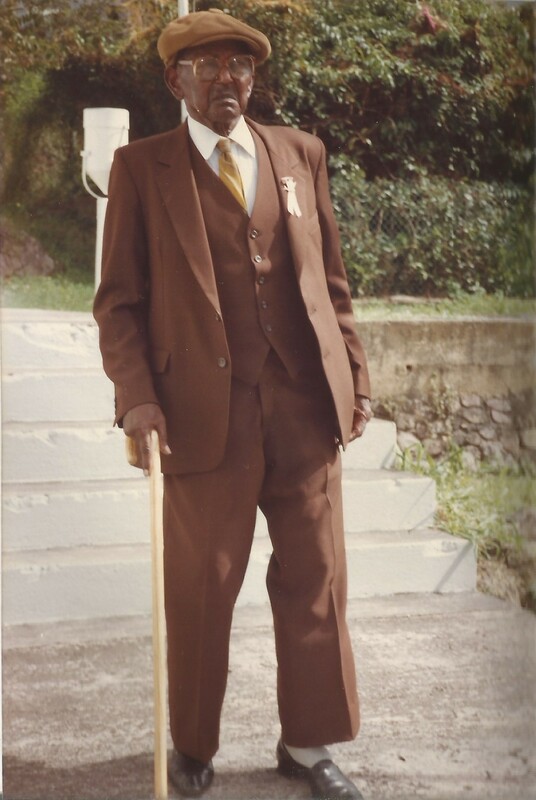 Maximillian Joseph Huith was born on St. Maarten on Saturday June 9th, 1909. His father was Gustav Adolf Huith who was born in Menningen (Beiren-Germany) on Sunday 13 September 1868 and his parents were Konrad Huith and Marie Katharina Eck. He was recruited as a police officer by the Dutch and sent out to St. Maarten. 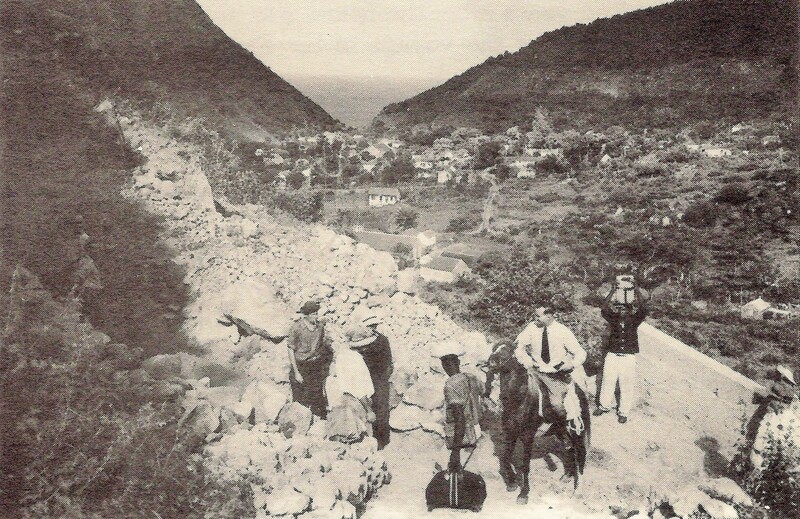 There were several others like Voges, Bremer and so on who came out from Germany, names which are synonymous with St. Maarten these past hundred years. Mr. Max Huith’s mother was Rosella Augustina Hollander born on St. Martin on Friday 25 August 1871 and her mother was Sophia Hollander. Vice Lt. Governor Max Huith checking on road progress. Back in those days there were also many epidemics passing through the islands and Mr. Max Huith’s twin brothers died on January 22nd. 1912. They were Karl and Gustav Adolf. In that year there was diphtheria or something of the sorts going around and caused many deaths in all the Eastern Caribbean. He also had a sister named Agnes who married Mr. Carel Frederick Boskaljon in 1925 and she died at the age of 28. Mr. Huith was married to Cynthia Bernadine Labega who was born on Thursday 21 May 1908. Her father was the legendary teacher and author William Frederick Adolphus Labega and her mother was Marie Isabel Roberts. 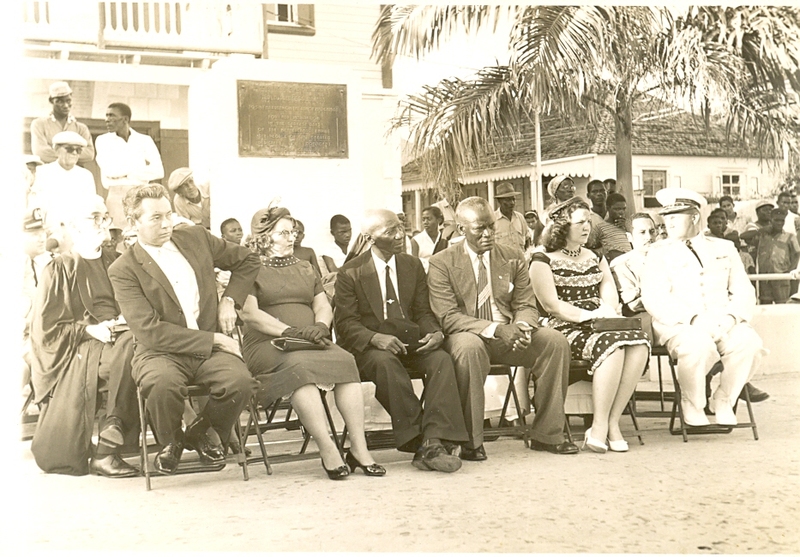 Administrator Max Huith with friends and Island Dignitaries around 1948. The St. Martin he grew up in was very different to nowadays. Despite the hardships, the unblemished natural resources of the island led one to acquire a lifelong attachment to this beautiful island. His family home was where Sang’s Supermarket is now located. I can still remember the old house standing there in ruins. Of course like so many others of his generation who made a career for themselves in the government civil service corps, they had no idea as to how St. Maarten would later develop or else they may have gone into the private sector. In the long run the property still proved to be a great asset to him as I am told that when it was sold the price was close to one million dollars. I have mentioned Mr. Huith in a former article as being the Administrator of Saba when the “Donkey on wheels” (The Jeep) was introduced to Saba in 1947. He served intermittently from January 30th 1943 until May 23rd, 1950. In between he also served for a period as Act. Lt Governor of the Windward Islands (January 22nd, 1945 to March 11th, 1946). Administrator Max Huith visiting the village of Hell’s Gate around 1947. Back then the Administrators kept a daily journal. 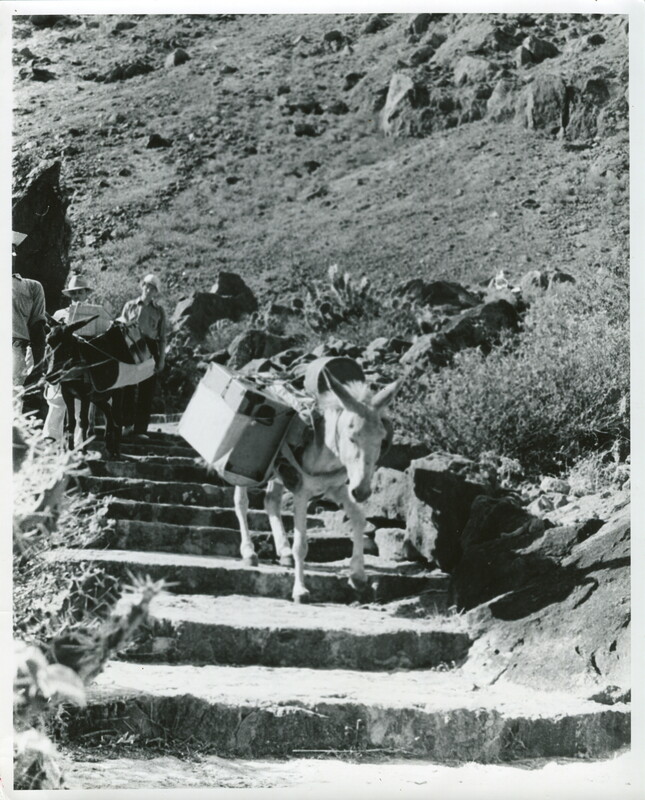 From Mr. Huith’s journal in the past I wrote the full story of the arrival of the first motor vehicle on Saba in: “Donkey on wheels”. I will just quote from the morning after the Jeep had arrived and could not start. Tuesday March 18th, 1947. “At 6.30 AM went to the Fort Bay to try to get the “JEEP” rolling. In the beginning the motor refused to start, so that the undersigned went back to The Bottom by horse for discussions with the Lt. Governor of the Windward Islands. In the meantime the Captain and the Engineer of the M.S. “Kralendijk” had worked on the JEEP and finally for the first time in the history of Saba, a motor vehicle was driven via the Fort Bay road over the roads of The Bottom.” And so a worthy person like Mr. Max Huith stood at the cradle of a momentous change in the lives of Sabans long fought for by people like Mr. Errol Hassell and many others who had long voiced the hope for this sea change on Saba. Administrator Max Huith with friends around 1947. 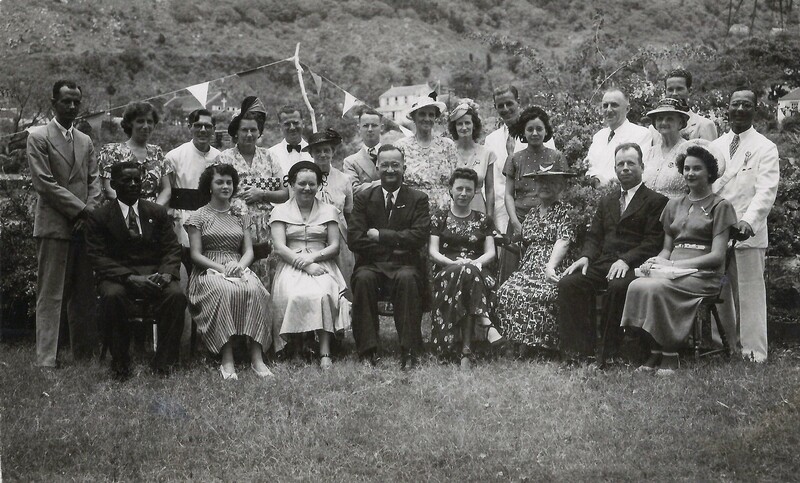 He was also on Saba when on January 26th, 1950, Prince Bernhard was the first Member of the Dutch Royal family to visit Saba. 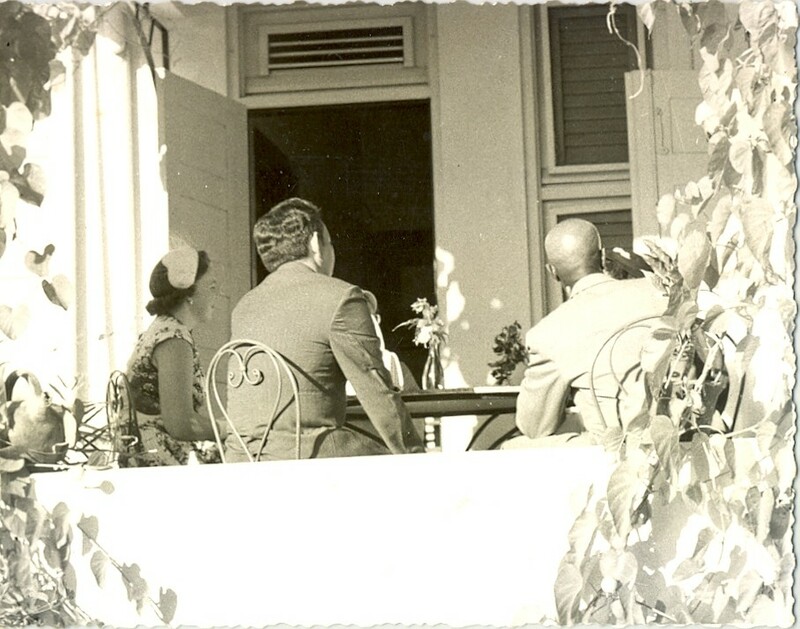 I found a photo taken secretly by Mr. Huith’s son Karel with his father and Prince Bernhard while in discussion at the home of the Administrator. I was too small to know him personally at the time. Also he lived in The Bottom and there was no road only a footpath between Windwardside and there so I seldom got there before I started primary school there in 1953. 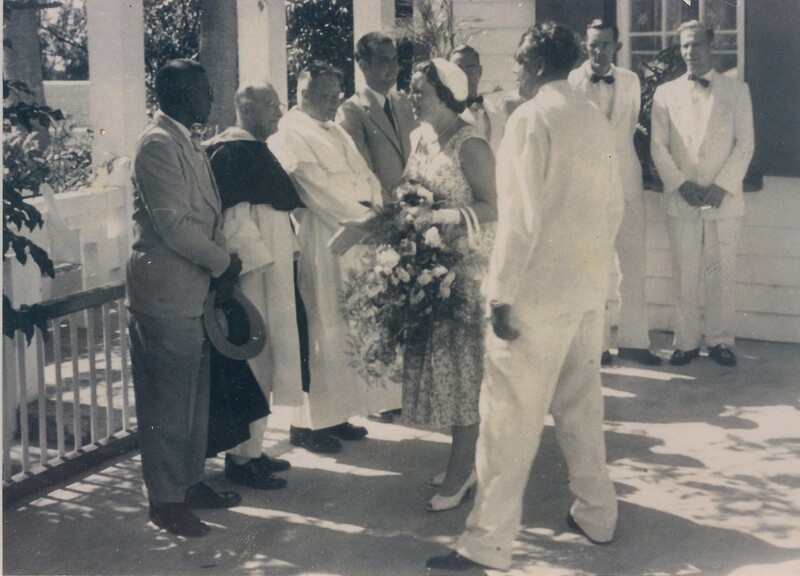 HRH Princess Juliana then in exile in Canada visited St. Maarten in 1944. The dignitaries from Saba and St. Eustatius went to St. Maarten by boat to see her. 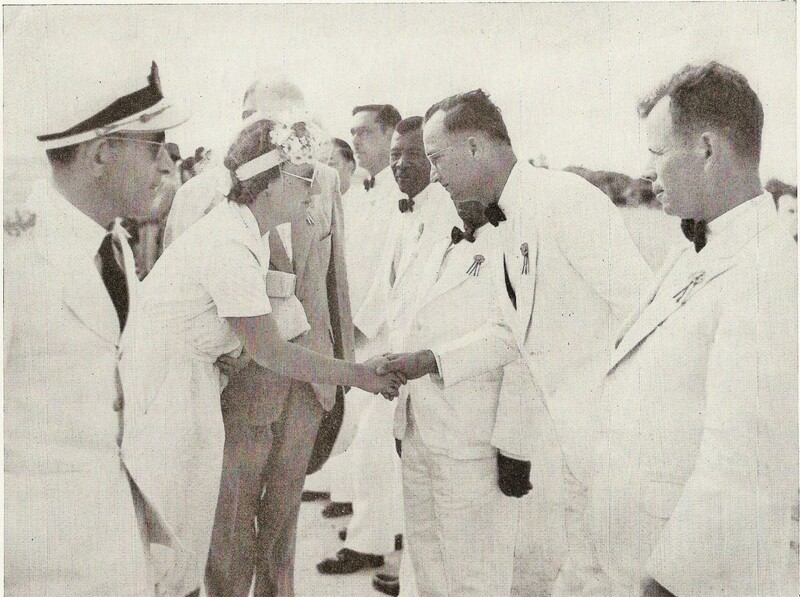 She is seen here shaking Administrator of Saba Max Huith’s hand, before him is Josephus Lambert Hassell (the road engineer). I again came in contact with him when I started working in the Old Courthouse in Philipsburg in 1960. Officially I was working in the Post office but my boss Fons O’Connor was also Notary, Treasurer, Canton Judge and agent for the Curacao Bank. I was called on to fill in for others when they were ill. I did not mind as I picked up a lot of experience by doing so even though my salary remained at around US $100.—per month. Mr. Huith came into the picture as comptroller from Curacao of Government assets in the Windward Islands. He would come to these islands from Curacao at least twice a year. No calculators back then and I have never seen anyone before or after who could add up numbers on a sheet of paper as fast as he could. You would see his eyes roaming the sheet of numbers from bottom to top while using his pencil as a sort of measuring stick. When he reached the top he would place a number at the bottom of the page and wham in less than no time he would be ready and would move on. He and I clashed for the first time on a matter of government assets. There was a pack of old yellowed paper which had probably been made just after Noah’s flood. I always thought it strange that if I made any mistakes in typing a letter and which could not be erased, Fons pulled a red line through it and we both had to sign it and there was a special file for this. 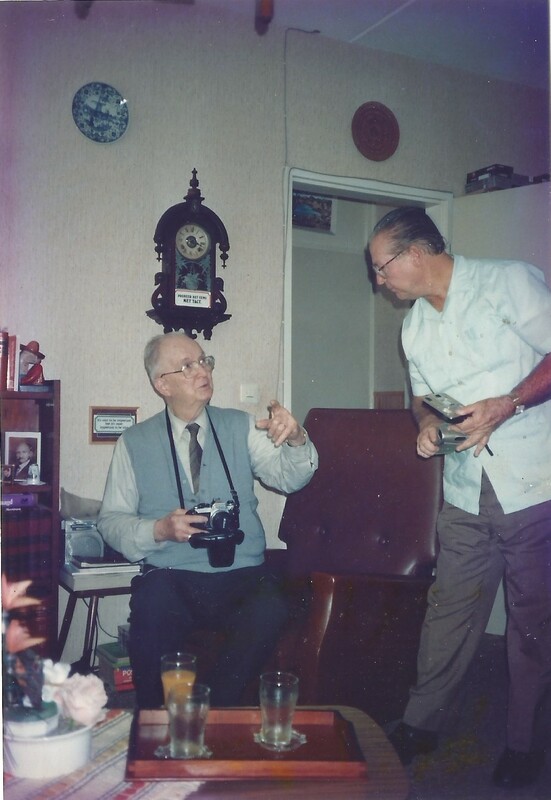 Teacher Mr. Frank Hassell paying a visit to Mr. Huith after he was retired and lived in The Netherlands. Mr. Huith if on his previous trip had left 100 blank copies from the Noah flood file, would have you check how many valid letters had been sent out and how many were in the spoiled letter file. If these added up to 25 then there had better be 75 blank copies over. I was a young rebel back then and under my breath I launched one set of Nixonians (President Nixon was known for using cuss words). Mr. Huith jumped on me and asked me what the matter was. When I told him that it was ridiculous to have such a foolish system in place, he looked me in dismay and said: “My boy the government paid money for that pack of paper and it should not be wasted.” That pack of paper must have been bought by government when Mr. Huith was a boy. Even unusable rusty paper clips seldom used had to be counted which was cause for me to again use a another flood of Nixonians. Mr. Huith in the meantime had become Inspector of Taxes under which Customs fell. In October 1962 I was sent to work in the Customs building in Willemstad on the corner of the “Handelskade” (Commercial pier). I was sent there to take a ten months crash course in assessing taxes and in collecting taxes, which knowledge was to be applied on St. Maarten on my return. I was lodging at the Hotel Washington just a short walk from my office. I have written an article in the past in Dutch for the NAPA, the Dutch language newspaper on Curacao on my stay at this hotel which was a combination of regular guests, and ladies from Central and South America coming to sell and purchase goods. What they sold is a matter for you to speculate on. There were no drugs back then so they had to make a living any which way they could. 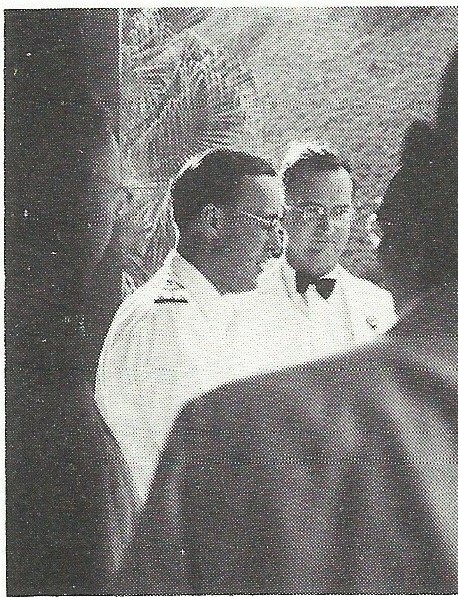 Visit of HRH, Prince Bernard to Saba in 1950. This photo was taken secretly by young Karl Huith then twelve years old. Anyway once again I crossed paths with Mr. Huith who was then my boss. Lots of good quality paper in that building and I even suggested to him, “Mr. Huith, man can you send us a new pack of paper for the Courthouse on St. Maarten?” By that time he and I had become friends. He had many fond memories of the years he had served on Saba and still kept in touch with the many friends he had made there. Even the rare visitor to the island would be entertained by Mr. Huith and his wife Cynthia. They too he kept in touch with. Just a few years ago I had contact with a lady from California who had been friends with them. 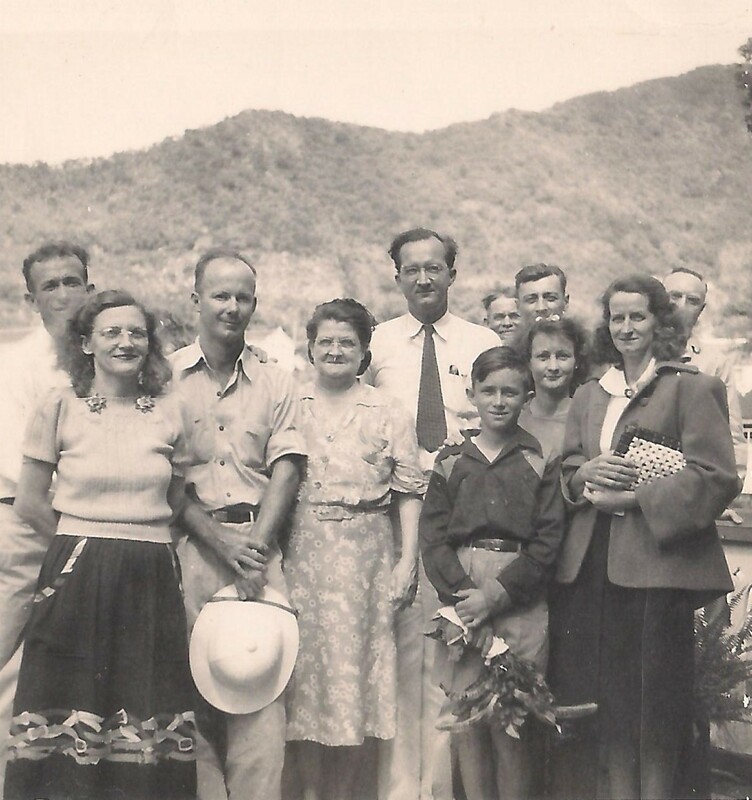 She and her husband (Leanne and Bill Carter) had spent their honeymoon on Saba in 1948 and she wrote to tell me all about her stay on Saba and sent me some photos of her and her husband with the Huith family, both on Saba and when Mr. Huith visited them in the United States. He was a very amiable man and an avid photographer all his life. I corresponded with him years ago and he sent me some copies of his photographs for use in my articles and books. I wonder whatever became of his collection of photographs of these islands. After Mr. Huith retired my former schoolmate later Prime Minister Minguel Pourier became the Inspector of Taxes. In the meantime Mr. Huith’s two sons had become Medical Doctors. I did not know them personally. One of them Karel E. Huith worked as urologist in the district hospital “Het Nieuwe Spitaal” at Warnsveld close to Zutphen. Frontstreet, Philipsburg. This scene seldom changed and this is what it would have looked like when both Mr. Huith and his wife Cynthia Labega were young people growing up there. Mr. Huith, after his retirement, and his wife moved to Holland to be close to their sons. Friends from Saba like Mr. David Donker kept in contact with them by mail, and I even seem to believe that Mr. Donker had visited them in Holland. He was the one who called to tell me the news that Mr. Huith had passed away. They loved in the town of Berkelo and I have a photo with Mr. Frank Hassell visiting them there. And of course Mr. Huith, then an old man, had his camera hanging from his shoulder. 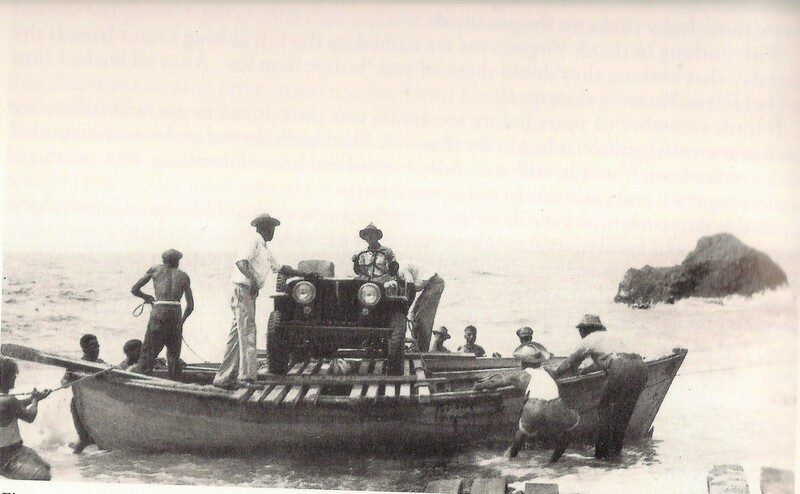 The famous JEEP or “Donkey on wheels” to be brought to Saba on March 17th, 1947 for then Administrator of Saba. Many of the islands residents especially women and children who had not traveled that much were able to witness a motor vehicle for the first time. At my age I enjoy writing these memories of times and friends long gone. 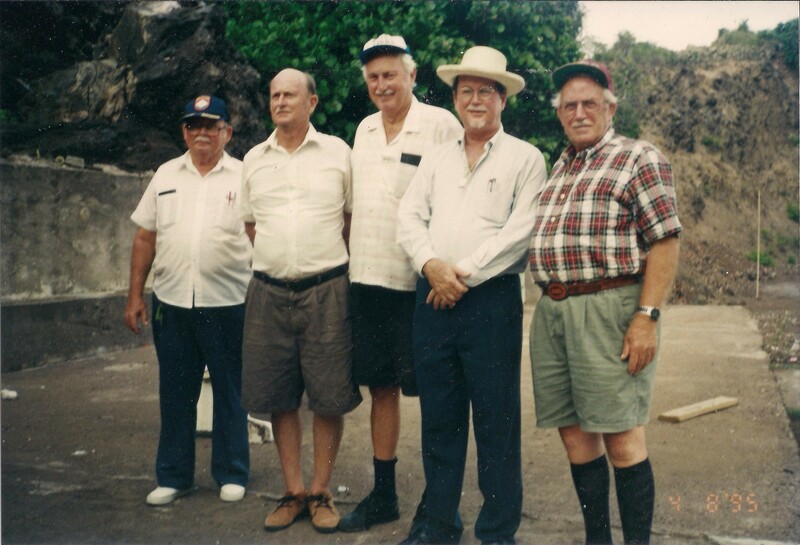 I happen to have found a number of photos with Mr. Huith when he was working and living on Saba as Administrator. The photos always attract a lot of attention for the readers of my column “Under the Sea Grape Tree”, and when I am going through my collection and I come across a photo from my past I immediately start writing a column in my head. So for this and many other reasons it is worth a whole deal to save and share photos of our past and friends we have known. I first met Alrett in 1966 when I was Secretary of the Public Transportation Committee. He was appointed as the member representing the taxi drivers. We had our first meeting at the old Police Station on the Back Street. Mr. Jelle van den Bos a police officer was also a member and if I remember correctly Mr. Jocelyn Arndell was the Chairman. I always remember Alrett for his smile and his sense of humor. I remember him once telling me the story of how he went to pay his respects to a dead person in Cole Bay. Each person coming into the room where the body was laid out in the coffin would pass comments like;’ Man he looking nice.’ Or “I never see he look so pretty yet’, and so on. Alrett said he turned to the person next to him and said;’ Tell me something partner, he’s dead isn’t he?’ But the compliments kept on coming in the direction of the dead man in the coffin. Mr. Alrett Peters, fifth from left. I have tried to get some photos from various locations but no success. When I do I will add them to this article. After the meeting we talked further outside the building and a friendship was established. The first mistake we made was to call a meeting in the P.M.I.A. hall on the Back Street with all the taxi drivers. The purpose of the meeting was to instruct the taxi-drivers as to their obligations. However that message did not get across. They thought that we were calling on them to unionize. One taxi driver (a friend of Claude’s no doubt) even asked us what was the name of the new political party we were forming. Well it ended up to be both a union and a political party. 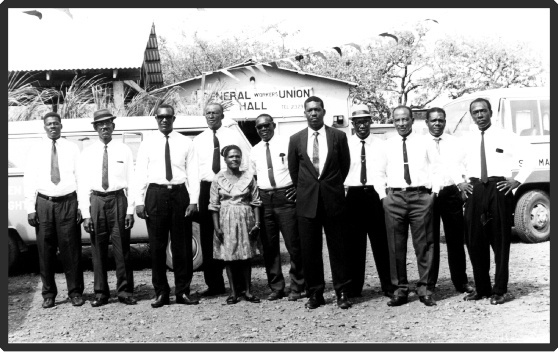 Mr. Peters went on to form the General Workers Union and the St.Maarten Taxi Association. The death of ‘Baco’ brought back memories of that period in my life. The papers did not mention that ‘Baco’ had an accident and lost his leg when he was a young man. He was a great football player before he lost his leg if I remember correct. He served for a time as Secretary of the Union at the Union Headquarters in Cole Bay. I don’t know too much about Alrett’s life before St.Maarten, other than that he had been born in Santo Domingo from St.Maarten parents. His wife was also from Santo Domingo and he had lived and worked on Aruba for thirty years as a taxi driver. In 1966 he decided to come to St.Maarten land of his ancestors and it is then that I became friends with him. The Public Transportation Committee was quickly perceived as a threat to government. As Secretary I did not get any pay. Once the law on public transportation was passed, the Secretary of the Committee was given NAfls. 25.—per month (an enormous sum at the time), and I was removed from the Committee. You see how they treat me! Or as the President of Iran told a reporter;” See how you talk down to my country!” That type of treatment only makes a person or a country more determined to do what they think is right. Mr. Alrett Peters, President; Mr. Raphael J. Maccow, Vice President; Mr. Julian Lynch, General Secretary, Mr. Julian Brookson, Commissioner and Mr. James Milton was Vice Treasurer. I stayed in the background and came up with the idea of starting a newspaper for the union. I worked in the Receivers Office at the time and my salary was f.192.50 a month and I could not afford to lose my job. Despite J.P. Morgan’s advice to Neil Vanderbilt I decided to jump into the field of journalism. Everyone knew that even though Alrett Peters was the official Editor that it was I who really wrote the Labour Spokesman. Alrett had established the Union headquarters in Cole Bay on property owned by his family. The ACE hardware store is where the Union headquarters used to be. In 1969 Alrett and his father and some of the Union Members returned my support for the union by signing up the URA list. (As Vincent Lopes, called it the ‘United Russian Alliance). The Democrat Party thought that I was a safe bet and that I would not get the 35 signatures needed on St.Maarten to get my list of candidates approved. Thanks to people like Alexander Richardson (‘Alec The Butcher’), Alrett Peters and his father and members of the union and some other brave friends I got the number of signatures just before the deadline. Unlike 1967 when there were no elections, I saved face for the Windward Islands. After the riots on Curacao, Alrett came to me at the Pasangrahan beach bar where I used to hang out in those years. We made a petition for a demonstration of solidarity with the workers on Curacao. Well you can imagine how well that was received. Police on we tail wherever we went. People being told to prepare for the town to be burned down by Peters and Will Johnson and them. A friend from the inner circles warned me to be careful. She had heard remarks being made and that caution was required. Around that time a few bodies had been found floating in waters off St.Maarten. Bodies of local people mind you. My friend did not feel I should be one of them. It was not always success though. I remember once that Alrett, Julian Lynch and others had organized Spritzer & Fuhrmann N.V. in the course of one weekend. After management went on the offensive by the next weekend out of probably forty employees, the Unions total was zero. Yes you read me correct. We did fix Little Bay Hotel though. The workers were not getting the trunk. The hotel decided that the tips were being used to pay employees in the off season. I used to like to hang out at the Little Bay Hotel beach bar as well. There I met and became friends with people like Forbes Burnham and his press secretary David de Groot. I remember once Clem Labega, I, and several others were under a heavy discussion using ever foul word a West Indian can think up, when someone whispered that we should have some respect. The young lady sitting at the end of the bar was HRH Princess Irene. Yes the same one that Governor Japa Beaujon had nearly fired me for dancing with, not once but twice, at the Passangrahan, under the sea grape tree. Anyway I used my time at the beach bar to distribute a pamphlet asking the tourists not to pay tips to the hotel as the employees were not getting any. They came to the table with the union quickly after that and the problem was solved. I stayed with the ‘Labour Spokesman’ until 1973 when I moved to Saba. Dennis Pantophlet took over the paper and let me tell you Dennis wasn’t easy either. His pen was steeped in the same bitter bush as mine was. After I left for Saba, Alrett continued with the Union and started a bus service. He had become a bit disillusioned with union matters. He had tried to ward off tour companies and car rentals by trying to get the taxi drivers to unite and invest in these companies themselves. Also he thought they should join up and all buy the same type of cars and get a better price from the dealers. However the ideas all fell through because they all thought too individualistic. That was the first time I had heard of his death. To this day it hurts me that I did not see him before he died. We had been good friends and had worked together for a good cause. And I did not land him in jail after all as Claude had predicted. On July 24th, 2007 when I made a speech about Claude in the community center on the Backstreet a lady friend of Alrett’s approached me and thanked me for my friendship with him. She knew and remembered. Alrett Peters was the founding father of Unionism in the Windward Islands. As I salute his memory I can state how proud I am that I knew him and was able to work along with him. I am also sad that I do not have a single copy of the “Labour Spokesman” and I don’t know of anyone who has a copy either. Such is life.